DRAGON is one of the most stunning Grand Banks models made to date! 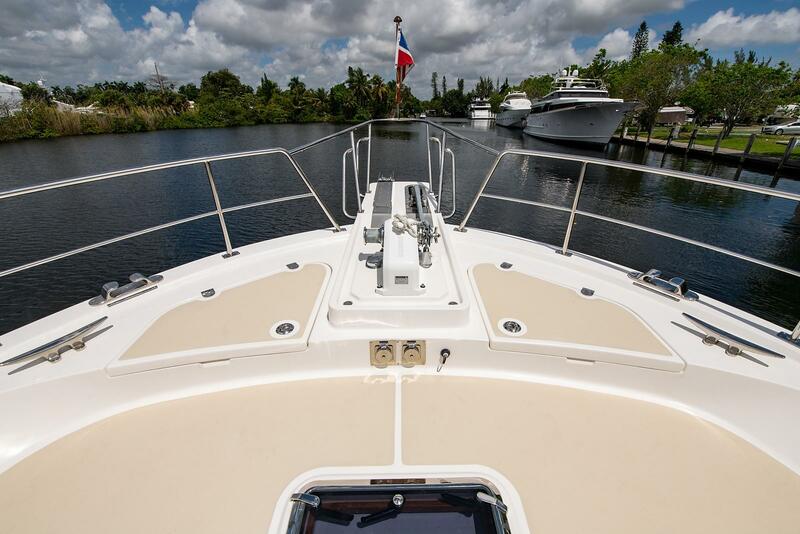 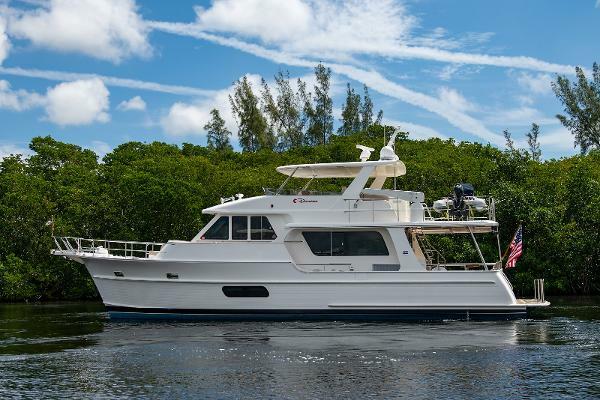 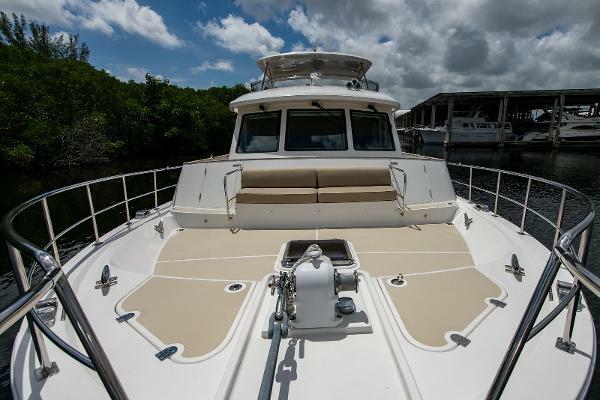 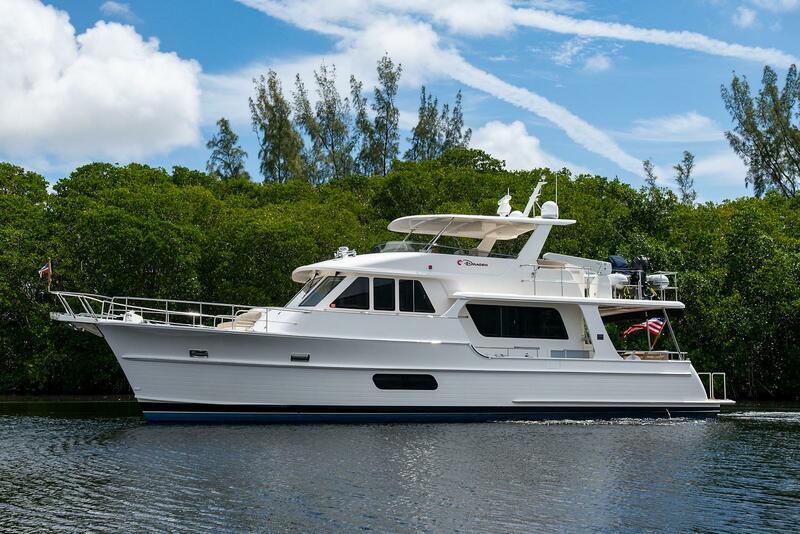 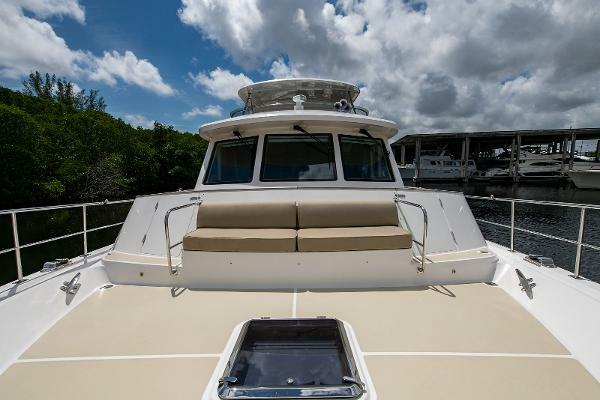 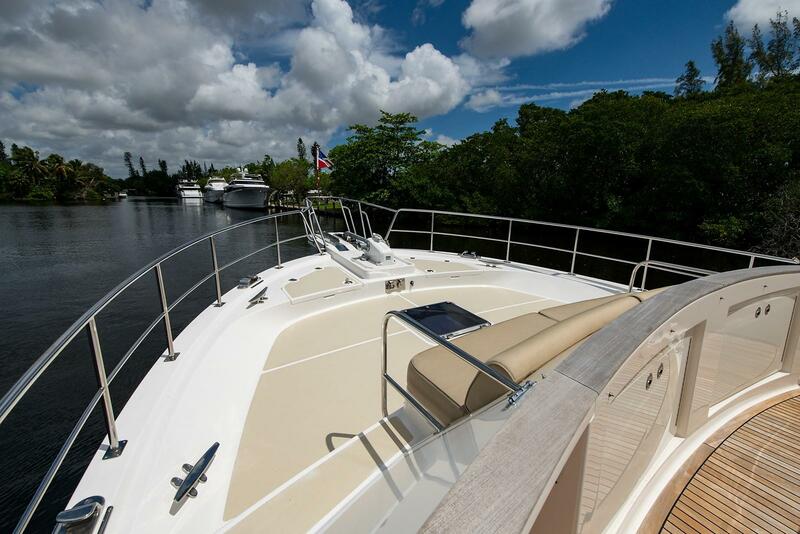 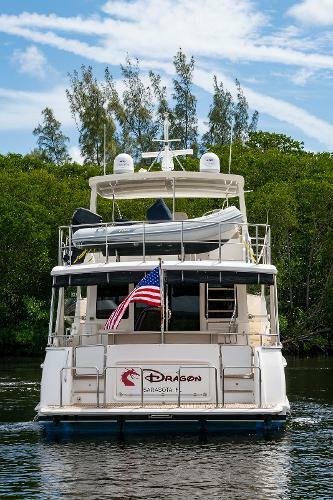 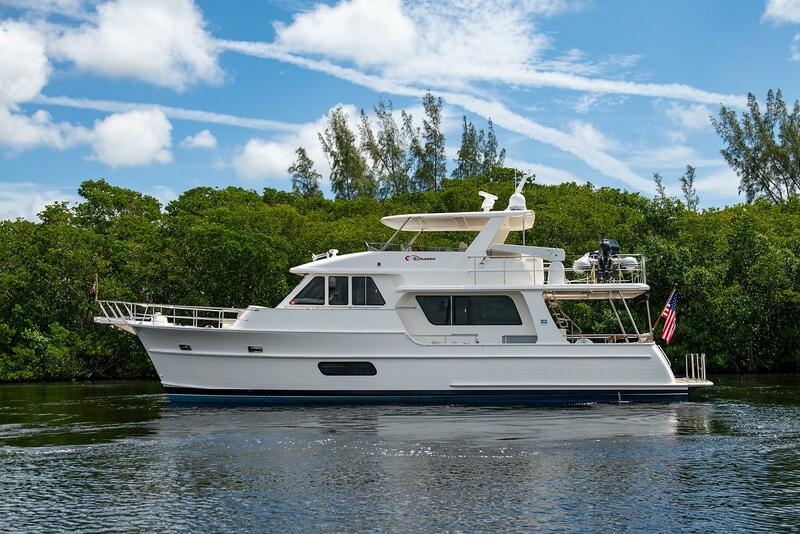 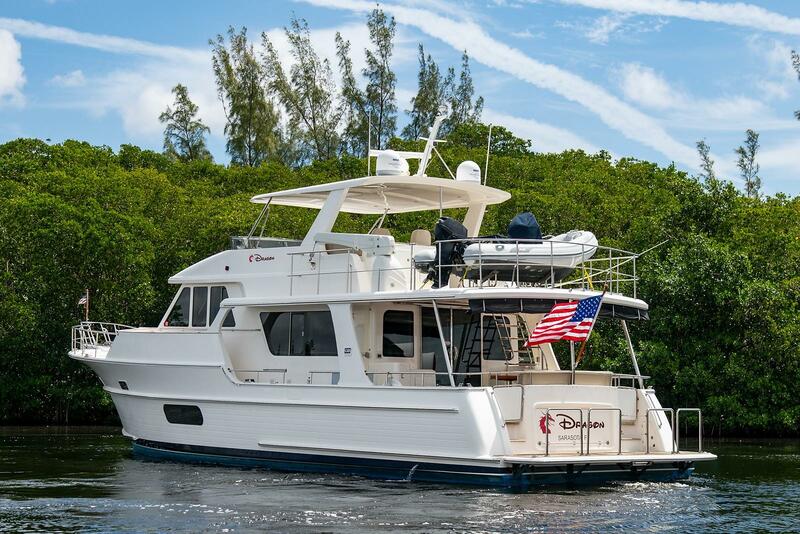 She features a 3 stateroom, 2 head layout with midship master, internal staircase from pilothouse to flybridge, spacious utility room with abundant storage and full size washer & dryer, Portuguese bridge, stand-up engine room, large covered aft deck, Garmin electronics, cruising speeds from 8 to 18 knots and much more! 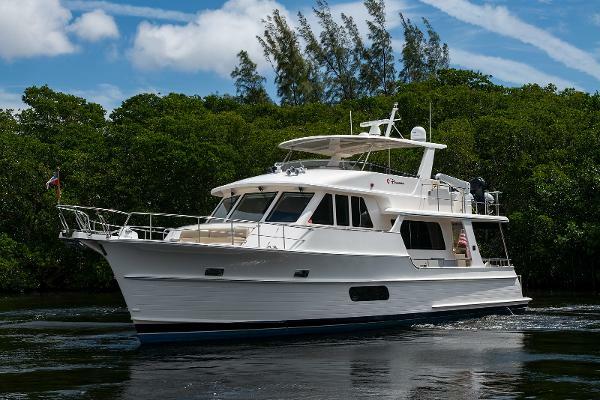 Her knowledgeable owners have kept her in fantastic condition. 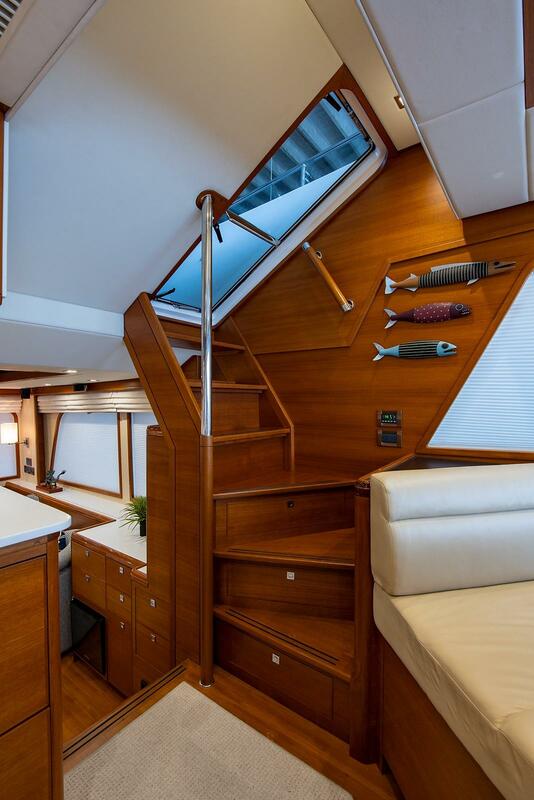 This is the only Grand Banks 55 Aleutian RP available in the USA and will not last long! 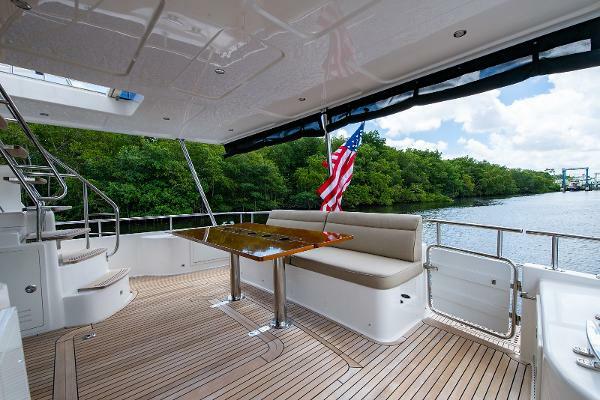 Starting with the completely covered aft deck, a tremendous amount of space is available along with built-in seating and a large teak table. 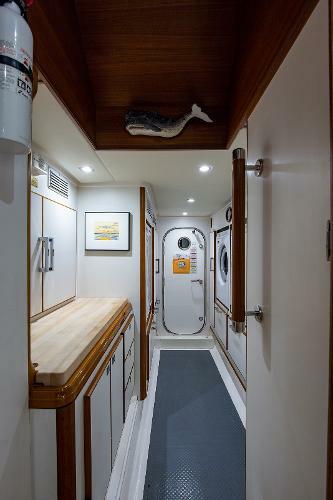 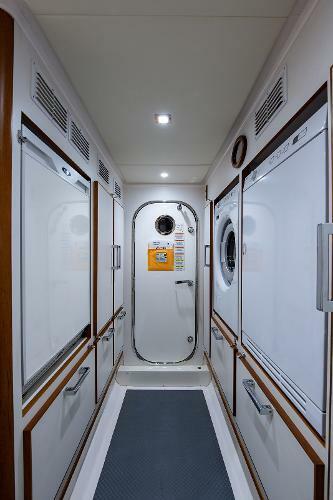 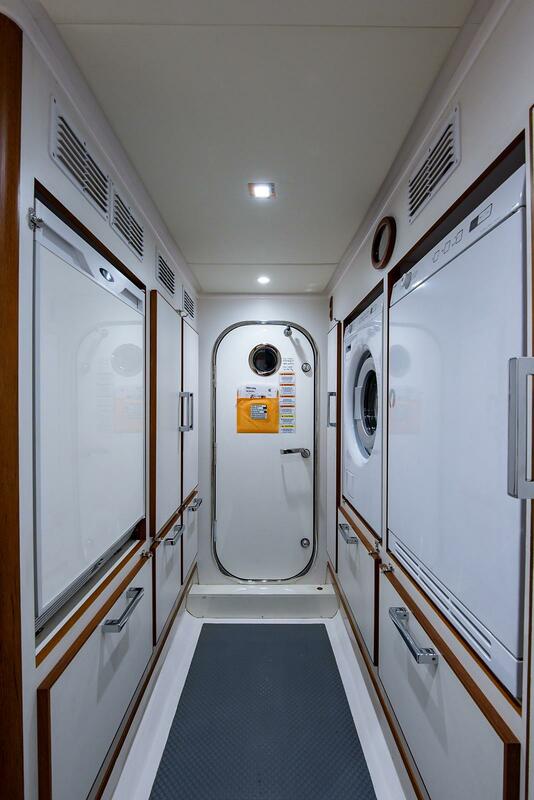 She has a fiberglass locker at the port forward corner with sink on top and icemaker in the cabinet below. To starboard is the access staircase with custom stainless steel grab rails and large teak treads for ease of passage to the flybridge. There is a large storage locker at deck level underneath the stairs and an aft docking station complete with throttle, and bow & stern thruster controls outboard. 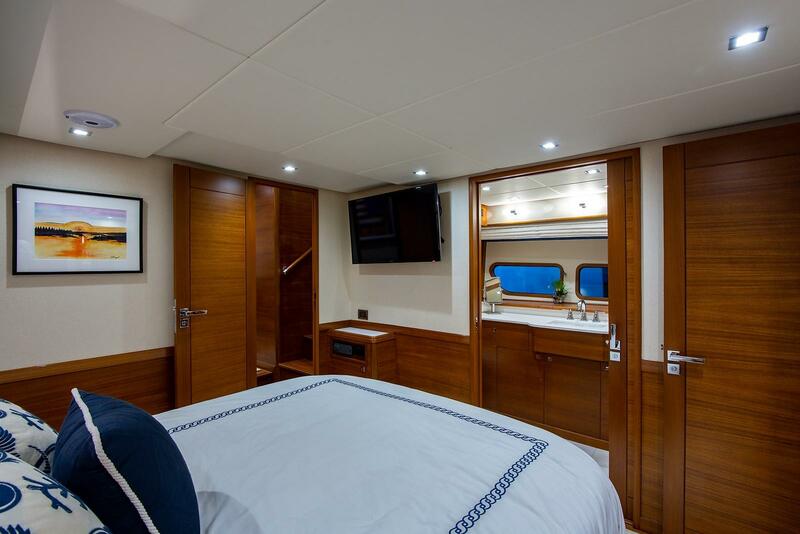 When you enter the salon through the two (2) aft deck doors, which have Phantom screens that come together and attach magnetically, the area is extremely spacious with her 17' 9" beam which makes her seem like a much larger yacht. 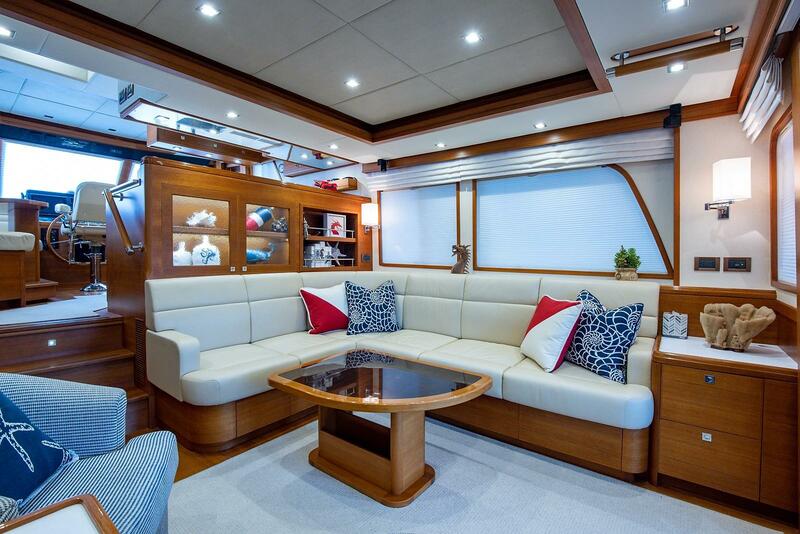 In the salon, there is an L-shaped settee to starboard with storage below. 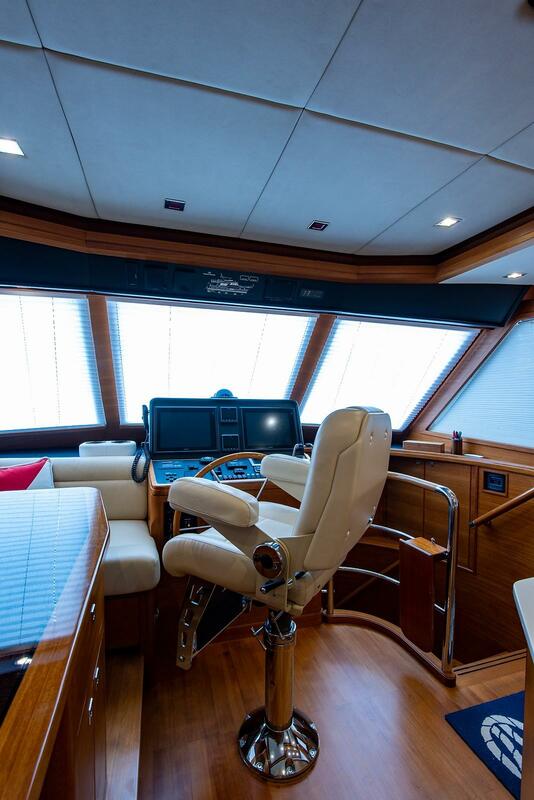 On the port side are two (2) custom barrel chairs with custom teak cabinet with drawers between. 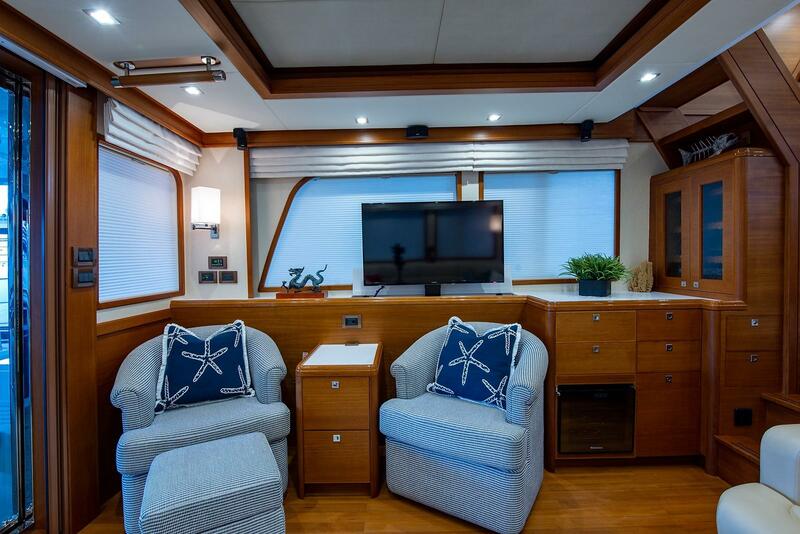 The Salon TV is to port and on a lift to hide away when not in use. Just forward of the barrel chairs is a locker with four (4) large drawers, a 9-bottle wine cooler and 8-bottle liquor storage. The Bose entertainment system and Panasonic Blu-Ray player are located in the forward port corner cabinet. 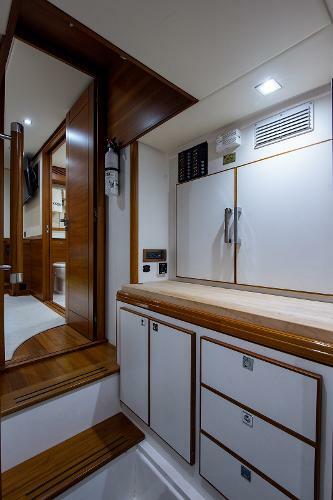 To starboard are display/storage cabinets and bookshelves. 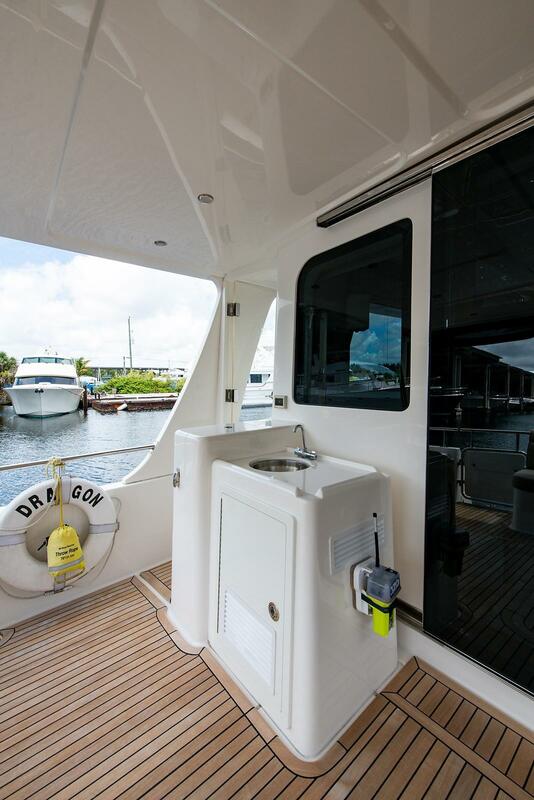 Custom OceanAir blinds are installed throughout the main deck level, including three (3) electric blinds at the forward Pilothouse windows. 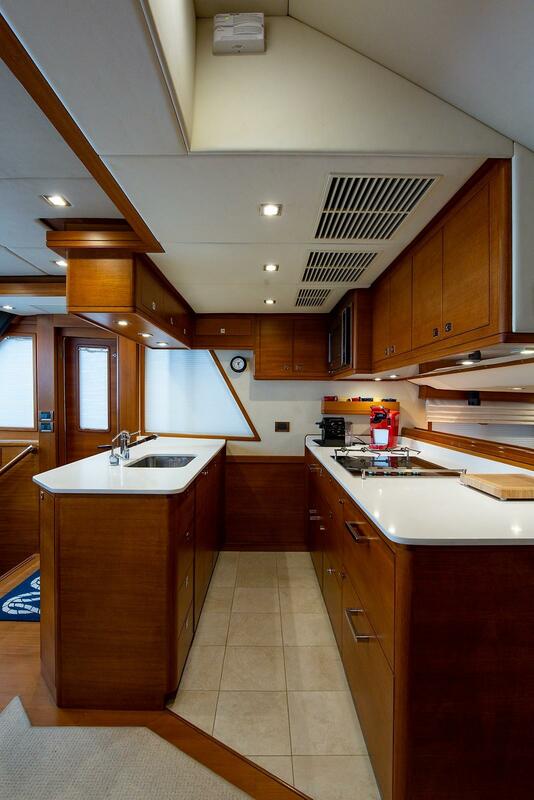 Move up three (3) steps into the galley/dinette area. 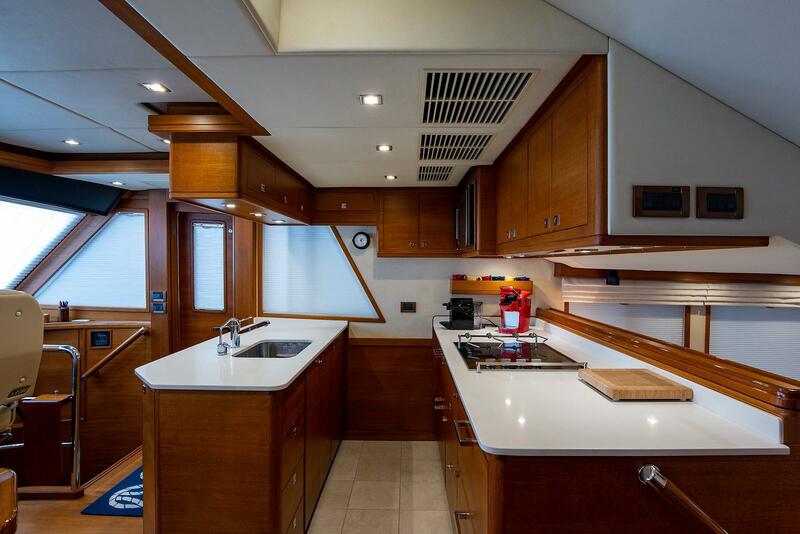 The galley is on the starboard side aft which is U-shaped featuring Quartz countertops, Sub-Zero refrigeration (3 fridge units and 1 freezer unit), microwave/convection oven above, overhead lockers for storage, several drawers for silverware, glass storage and other galley utensils. Looking at the forward side of the galley, there is a large sink and trash bin under the sink. 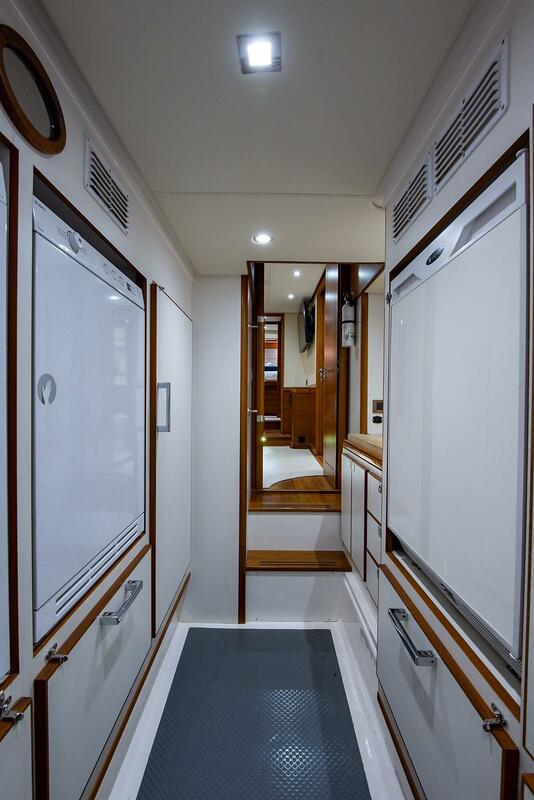 The dinette is located opposite the galley on the port side with storage below which works great for additional galley storage for long-term cruising. 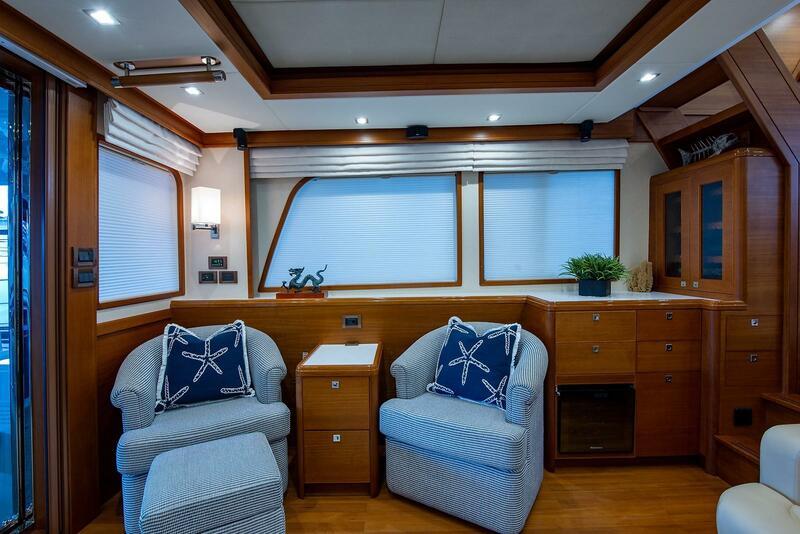 This is a very comfortable seating area with custom Hunter Douglas blinds. 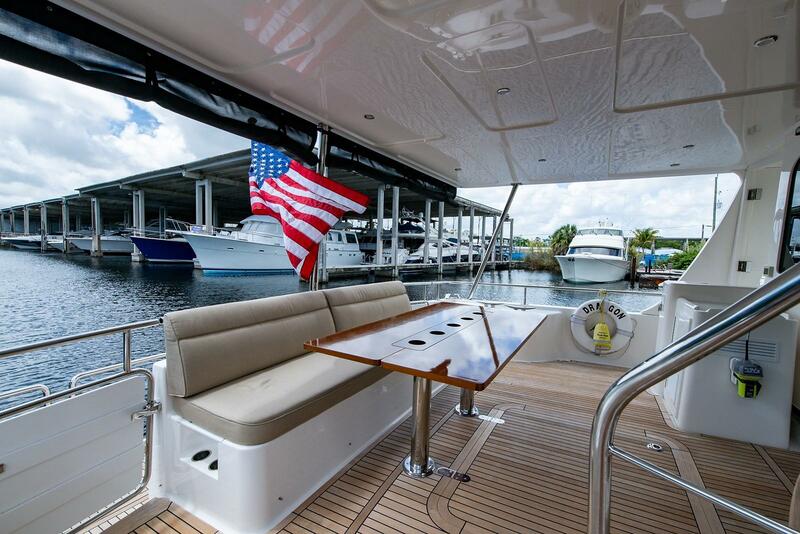 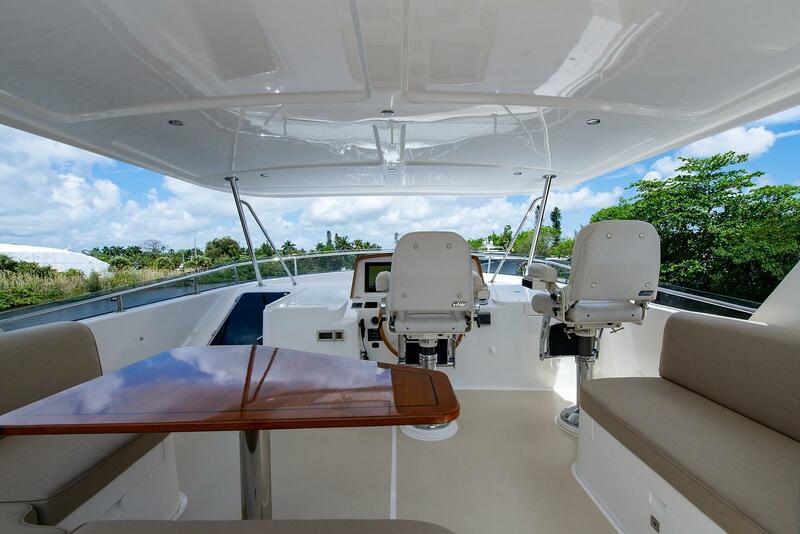 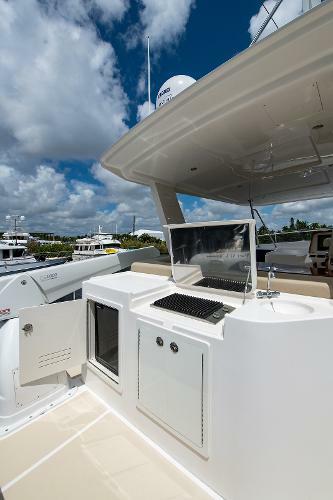 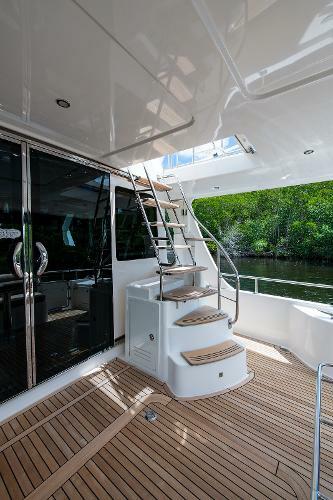 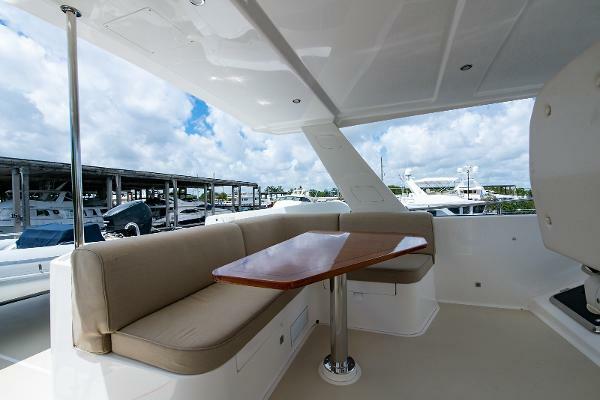 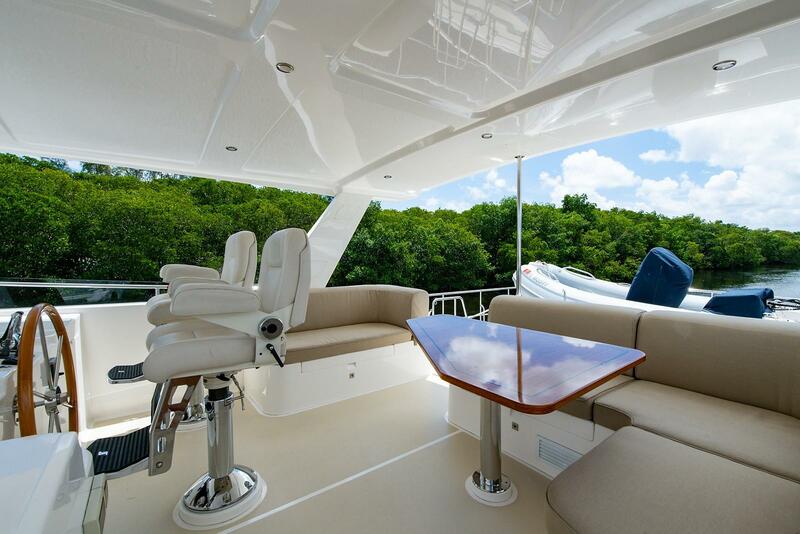 Aft of the dinette is an interior stairway providing easy access to the flybridge. 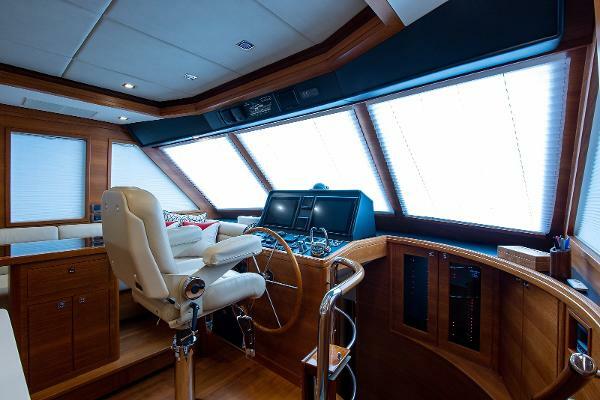 Moving forward, you have a starboard door with Phantom screen to reach the side deck, a STIDD helmseat and a very large electronics console. 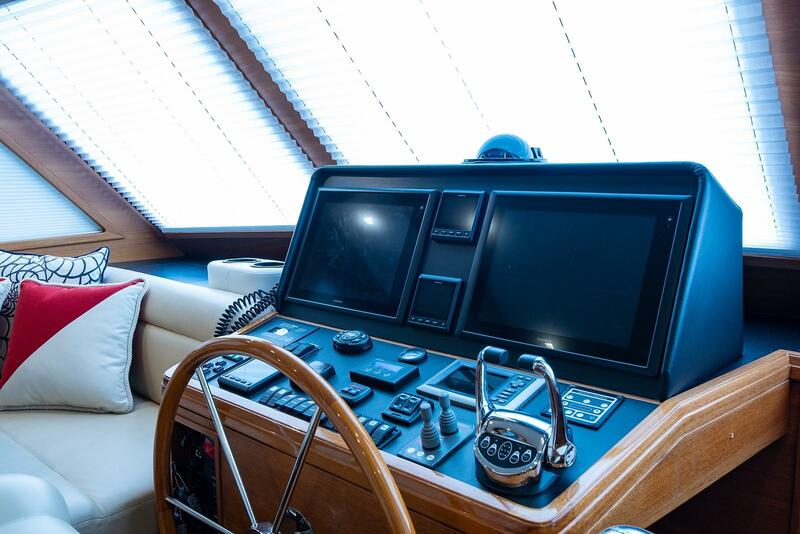 Operation of the boat from the lower helm is very easy due to the size of the windows and the proximity of the steering station to the bow of the boat; it’s very close. 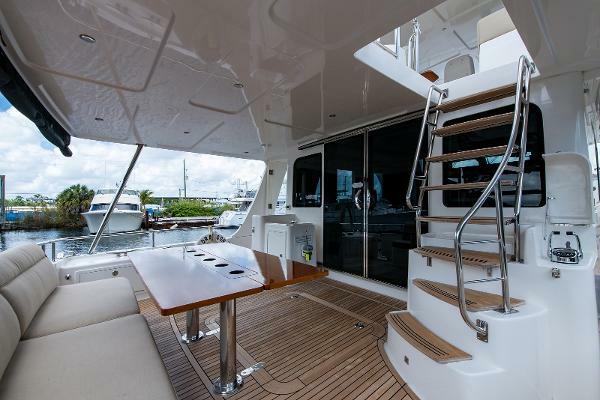 Also on this level, you have almost a full 360-degree view and you can easily step out onto the starboard side deck to help with dock lines. 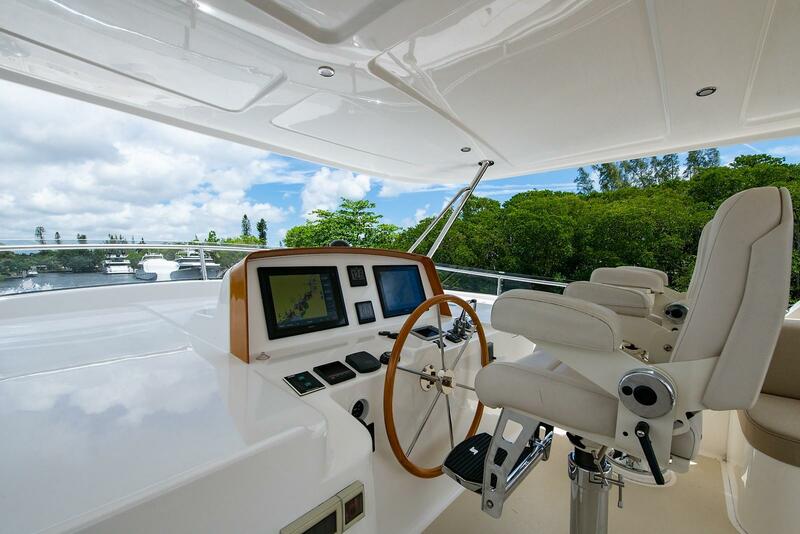 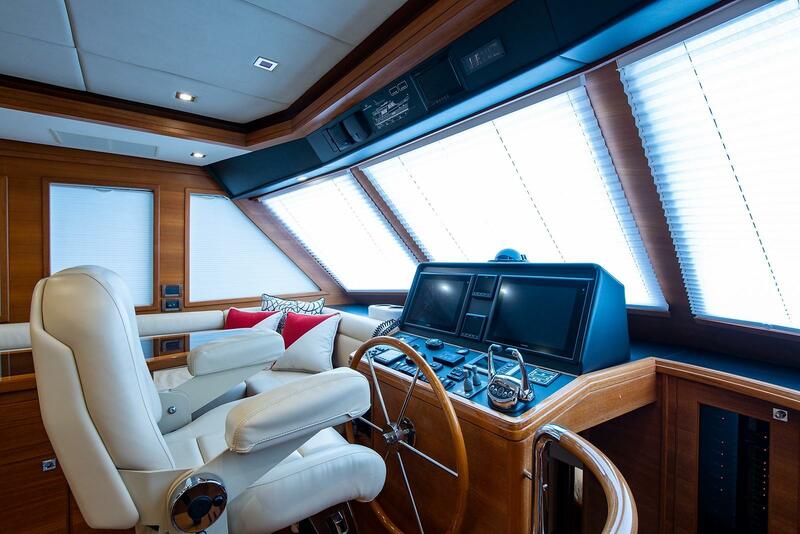 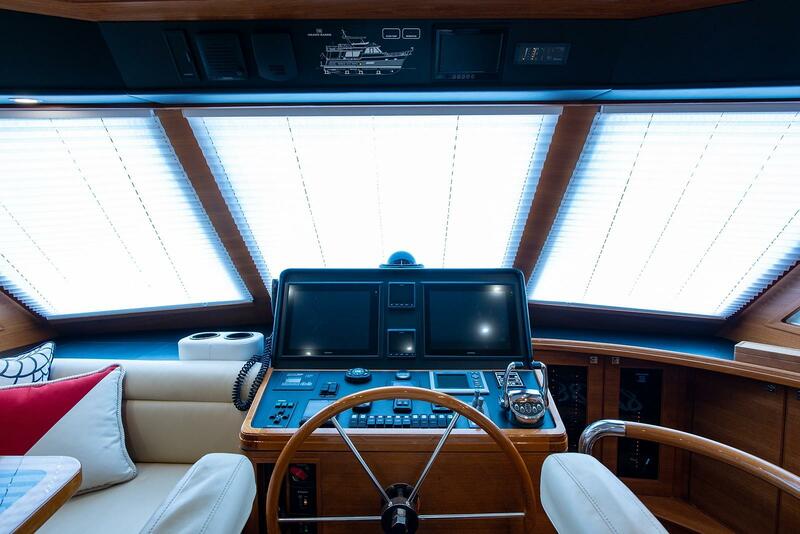 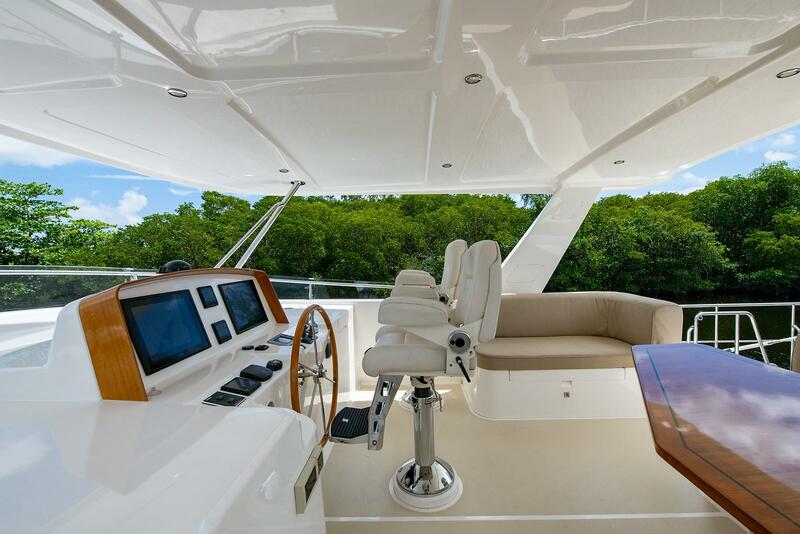 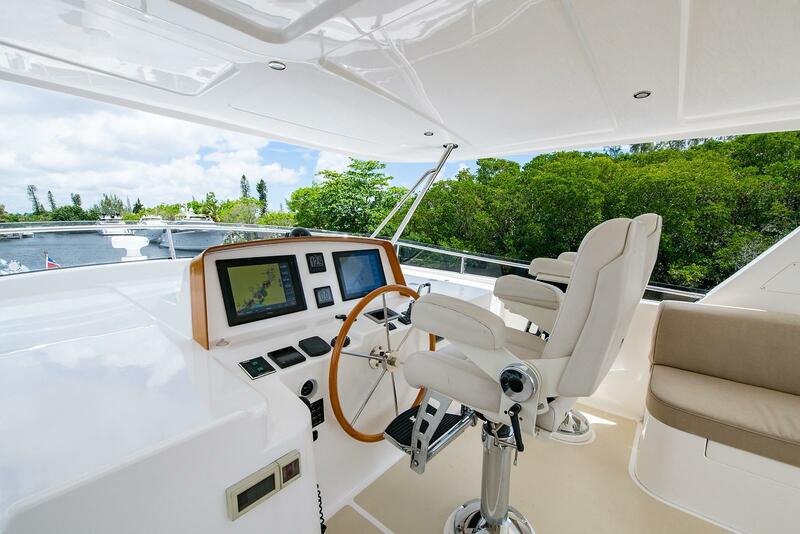 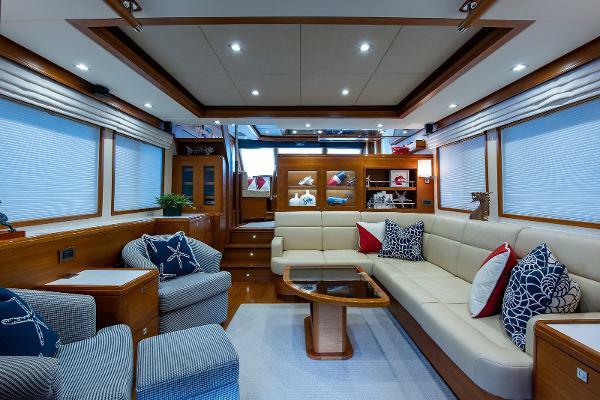 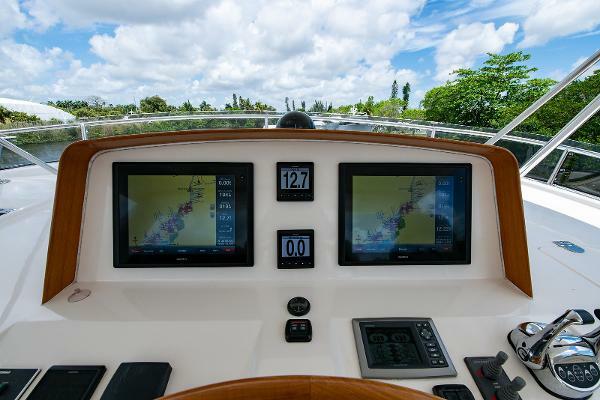 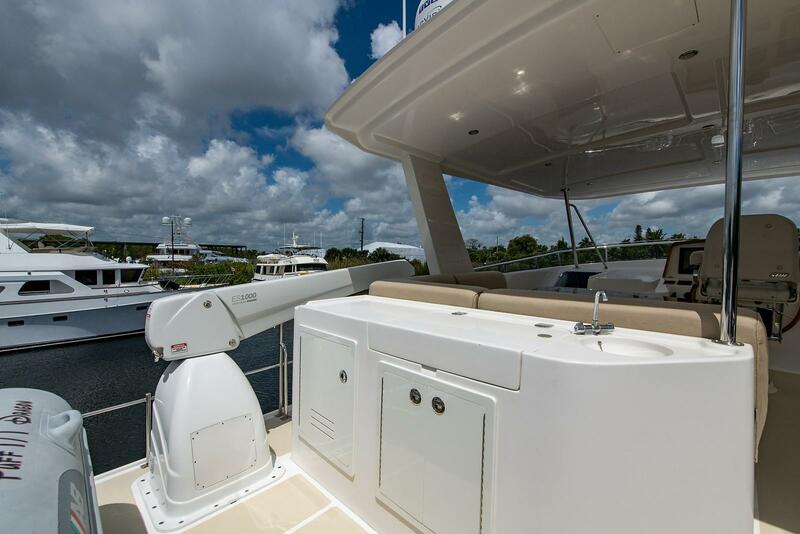 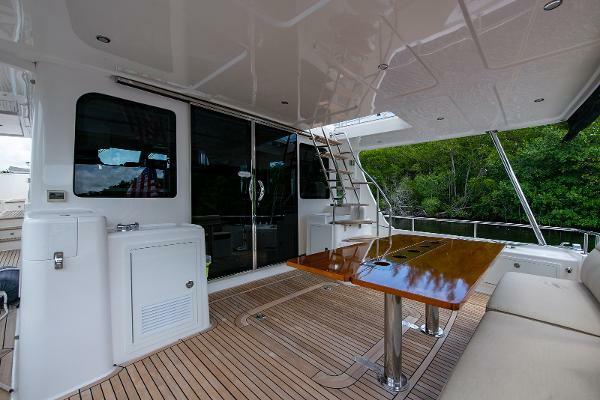 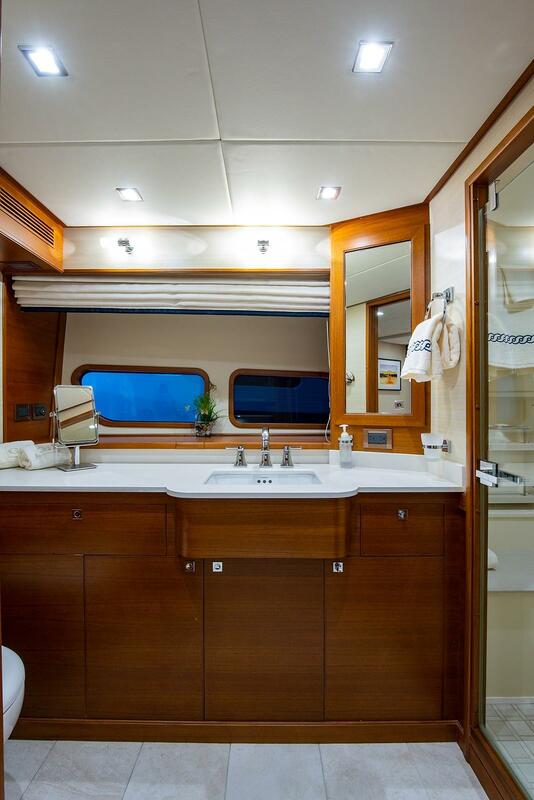 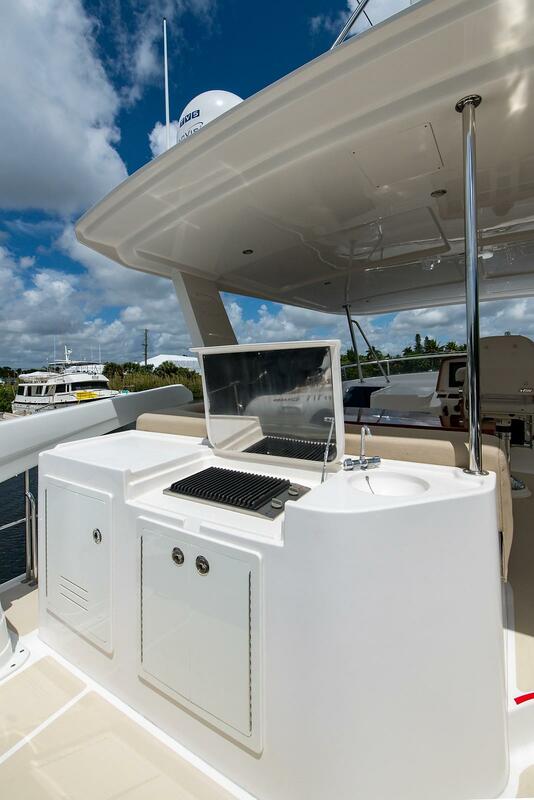 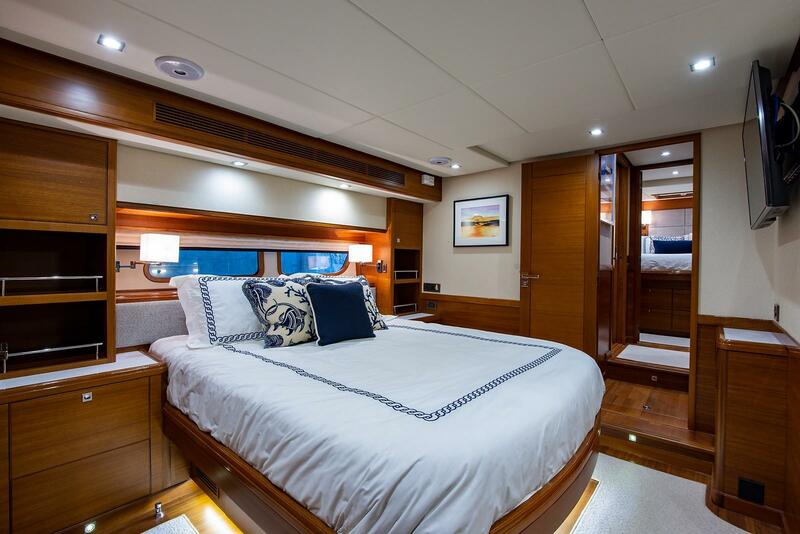 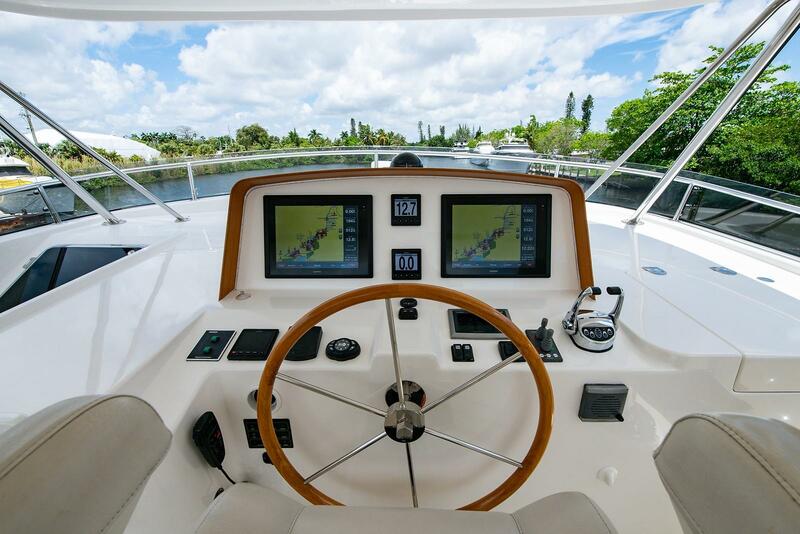 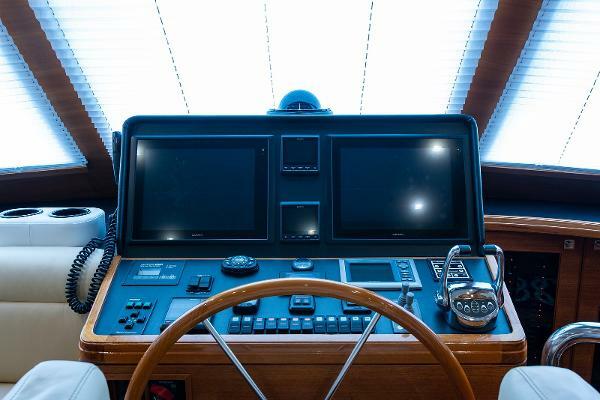 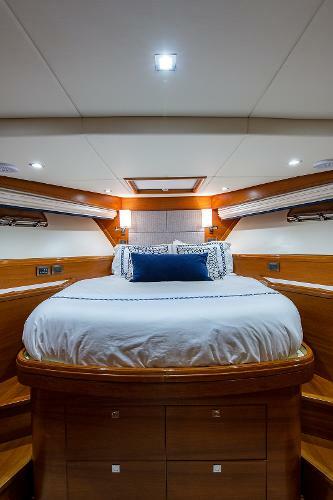 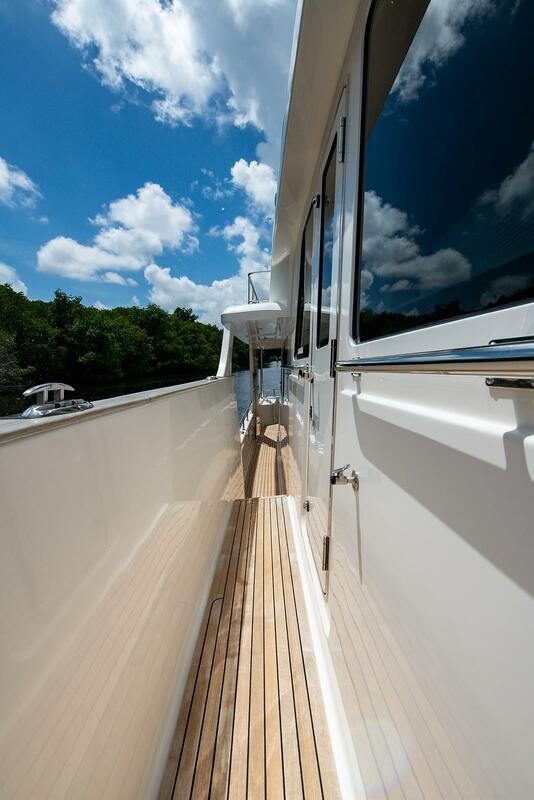 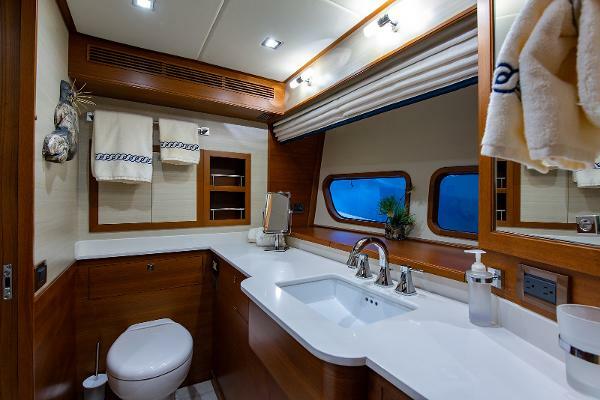 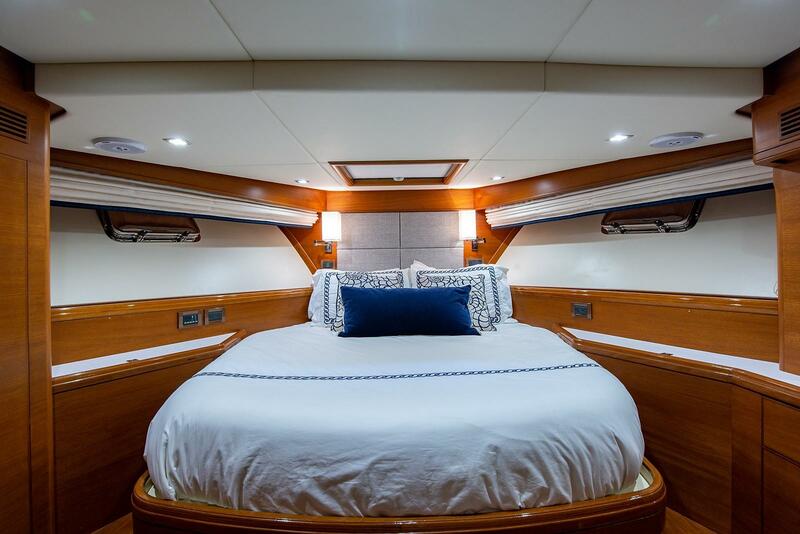 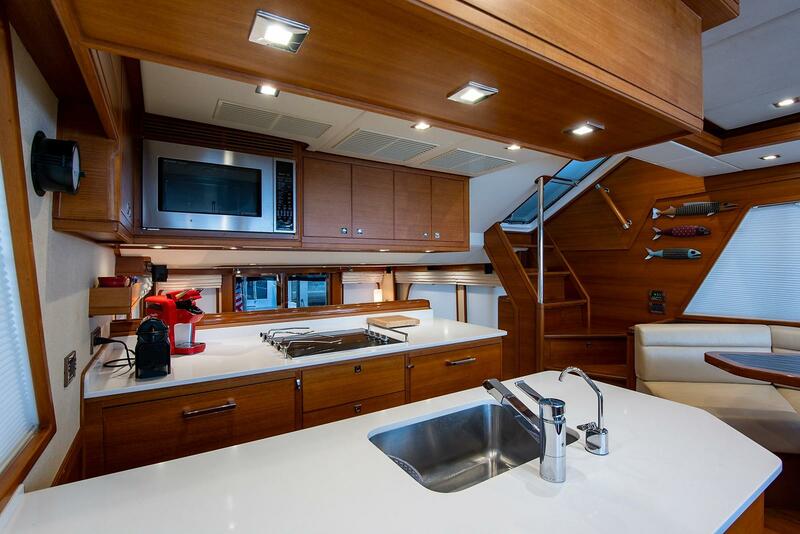 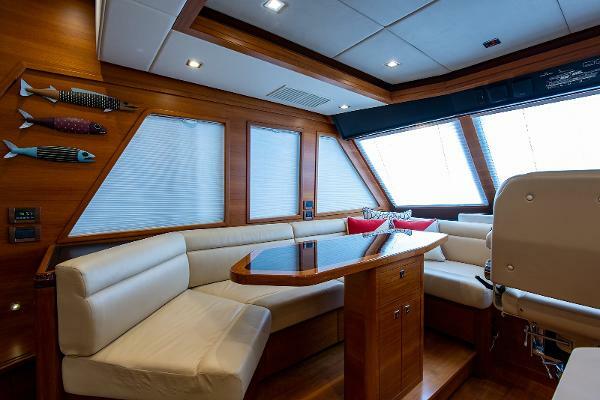 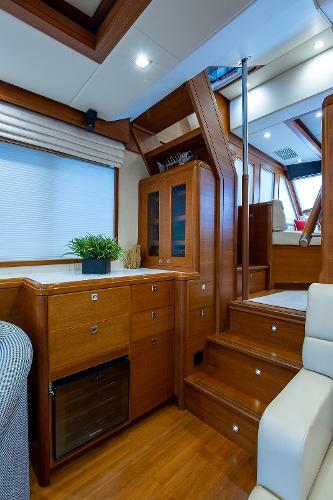 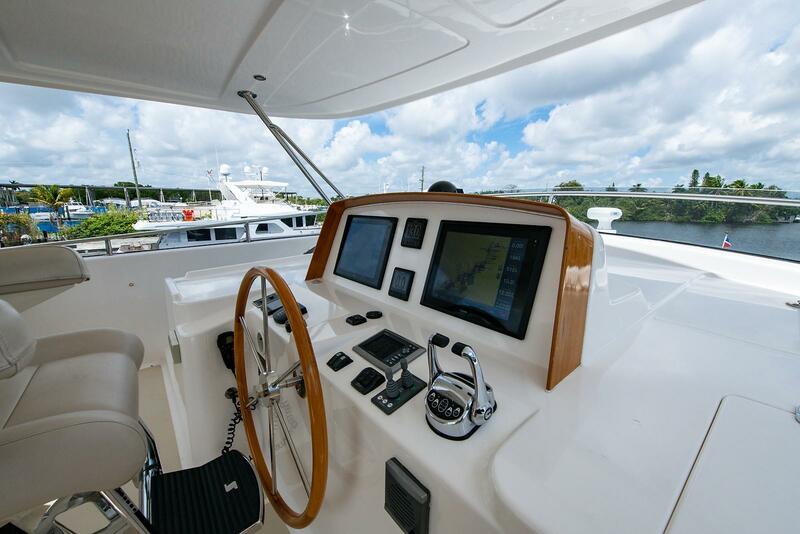 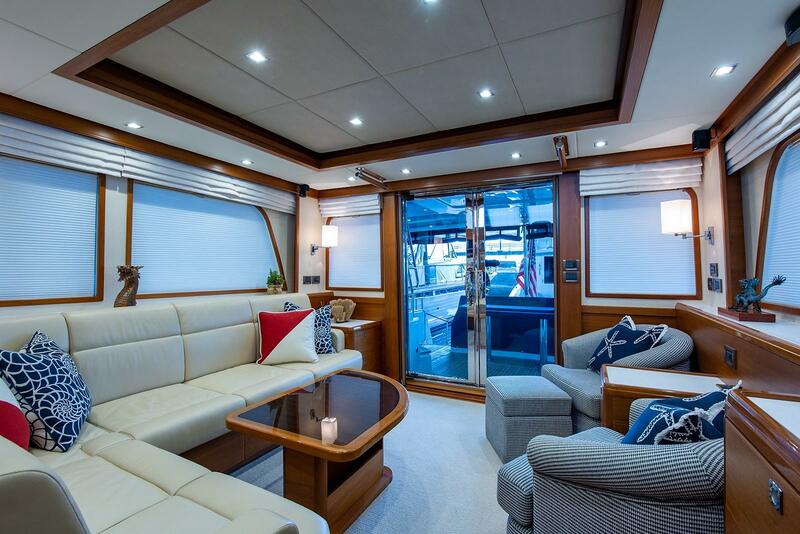 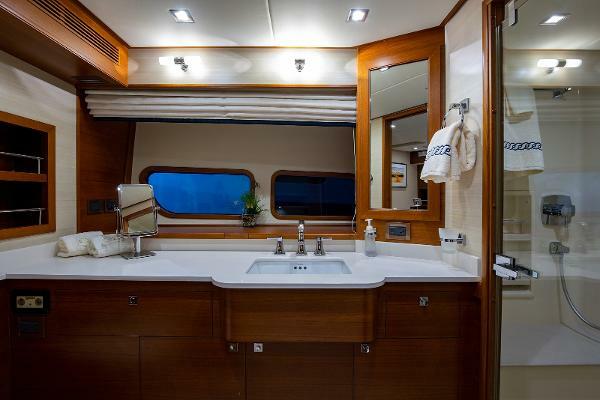 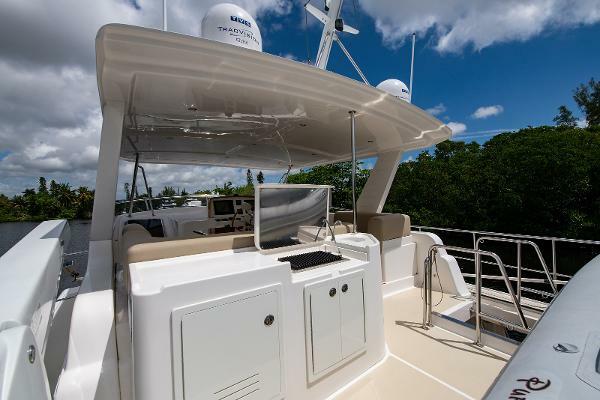 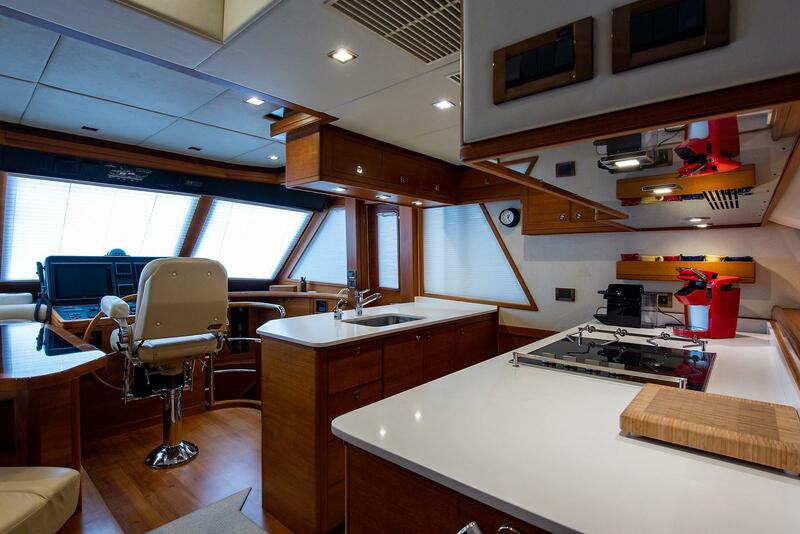 On the foredeck, there is a Portuguese bridge with storage cabinets and entry doors to the foredeck and bow areas. Just forward is a very comfortable seating area with storage below that could hold all the cushions for this area or you can leave the cushions set up and cover them with the standard Sunbrella covers. 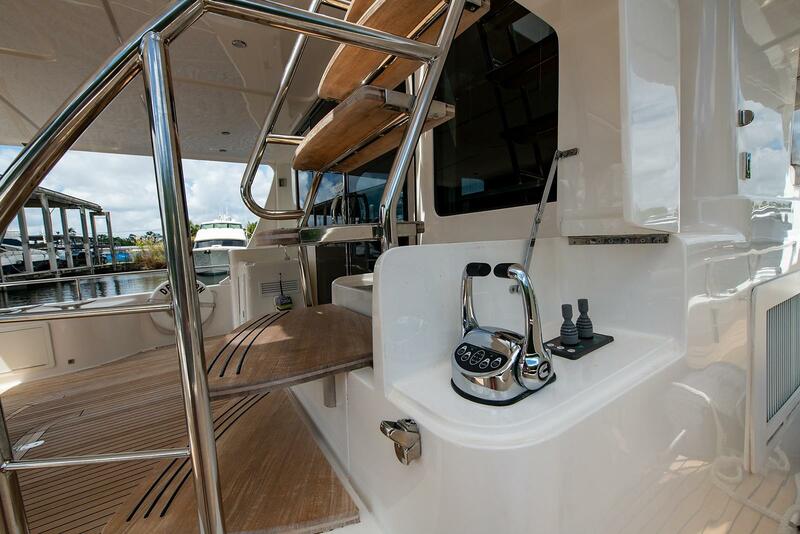 The stainless steel anchor platform is set up for dual anchors; the standard is a 75-lb. 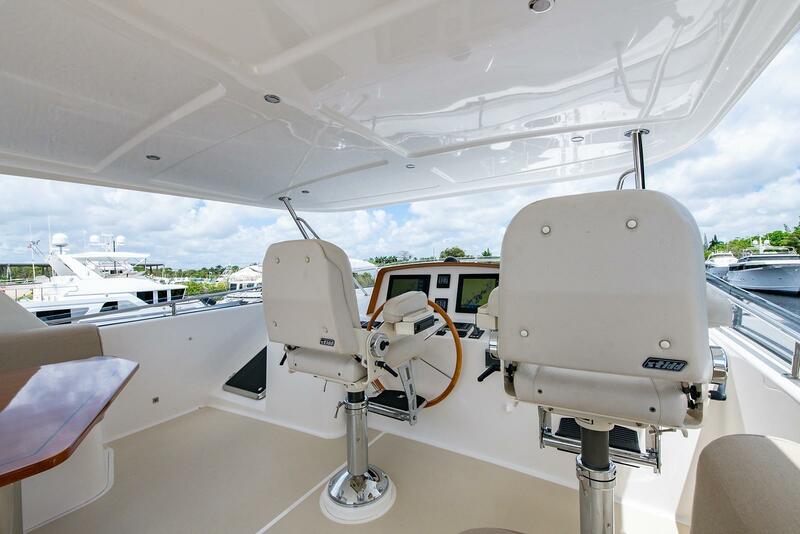 CQR with 200’ plus of chain. 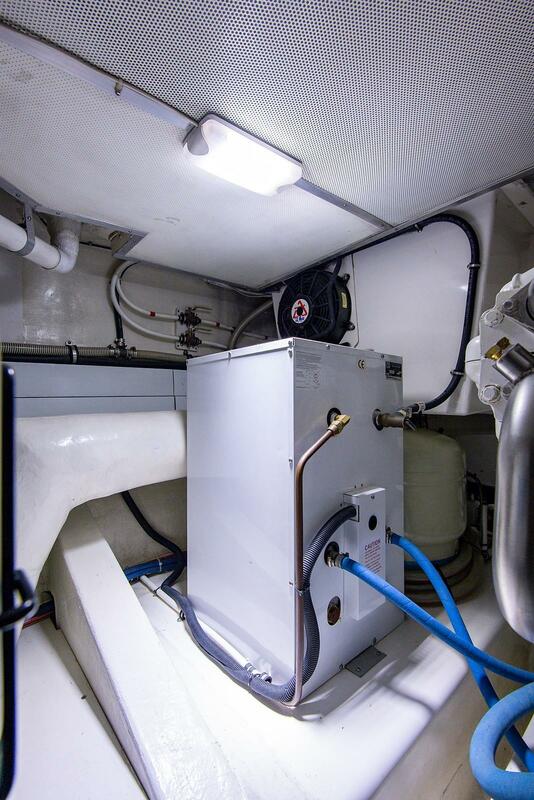 Outboard of the anchor platform are 2 storage lockers, featuring both freshwater and seawater washdowns. With her wide walkaround side decks and high stainless steel double rails, she is safe and easy for a couple to handle in any seaway. 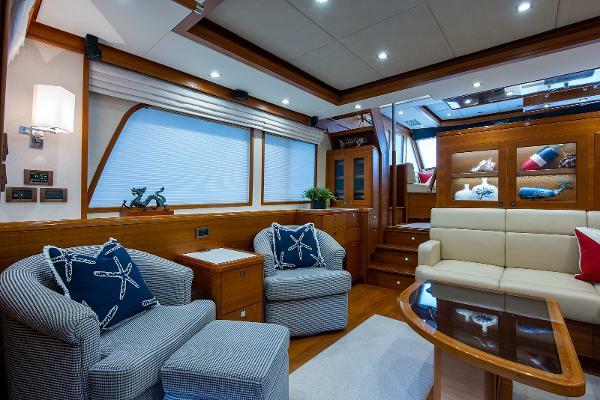 Up to the flybridge via the staircase on the starboard side aft deck or the interior stairway from the pilothouse, you have two (2) STIDD seats forward with a generous electronics console, a bench seat to starboard and there is a large L-settee on the port side with a teak table. 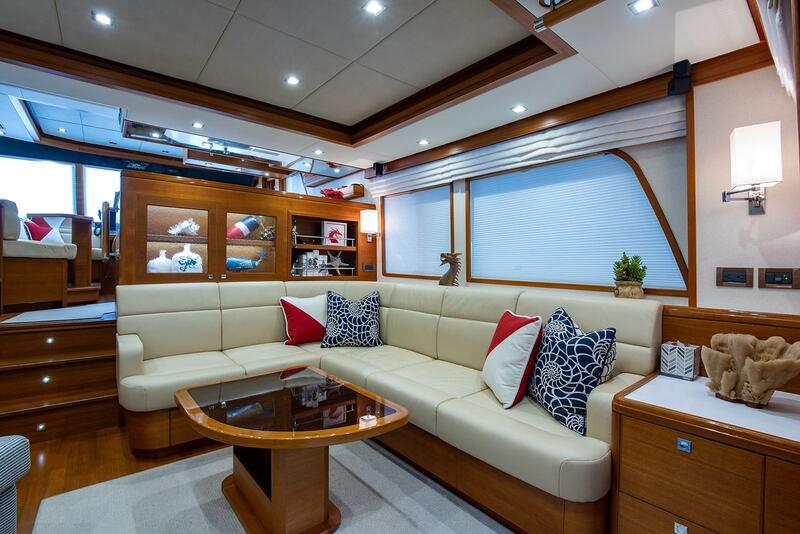 Storage is below all the seating. 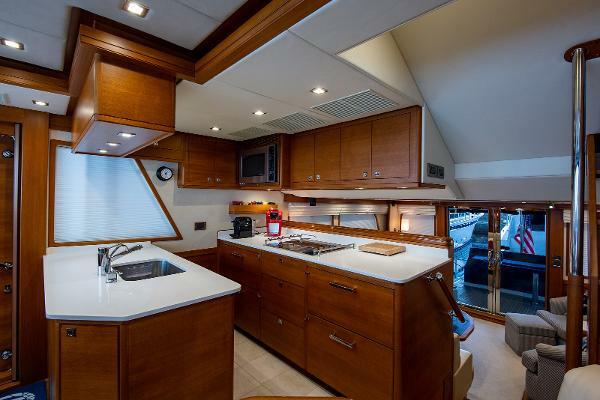 Aft of this, there are several lockers and a wet bar which offers an Isotherm refrigerator, sink, custom electric grill and storage locker. 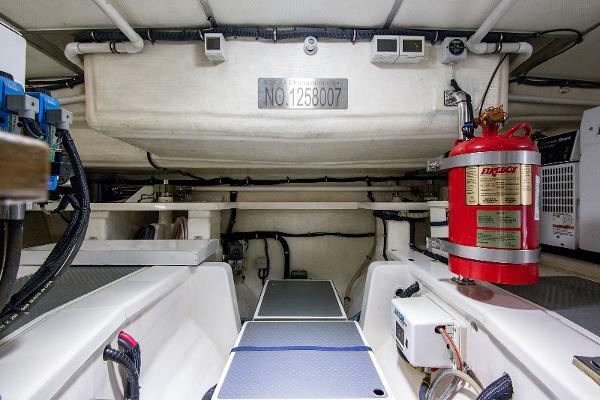 There is a standard davit with a Steelhead ES1000 1,000 lb. capacity and her AB 12VST tender with Evinrude 40hp outboard engine. 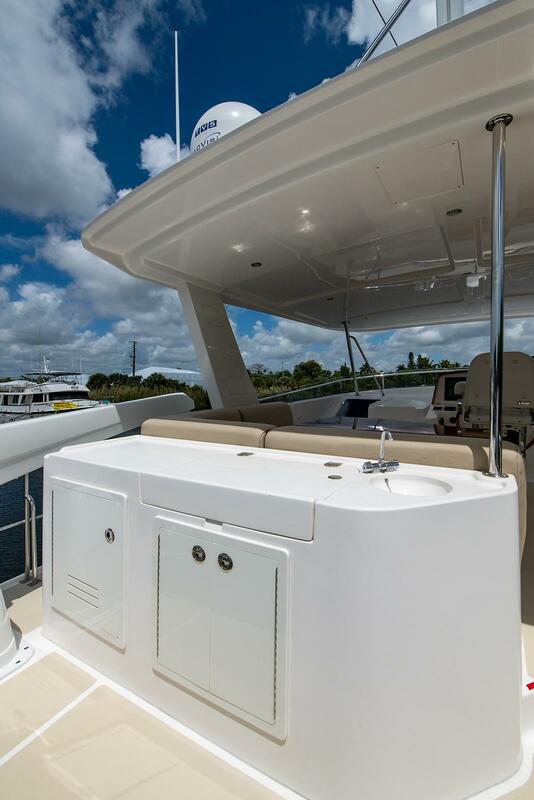 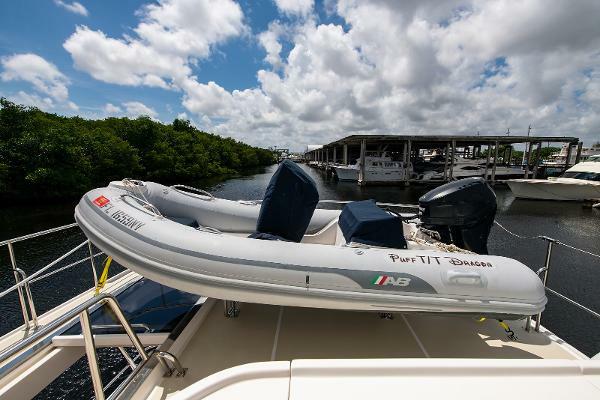 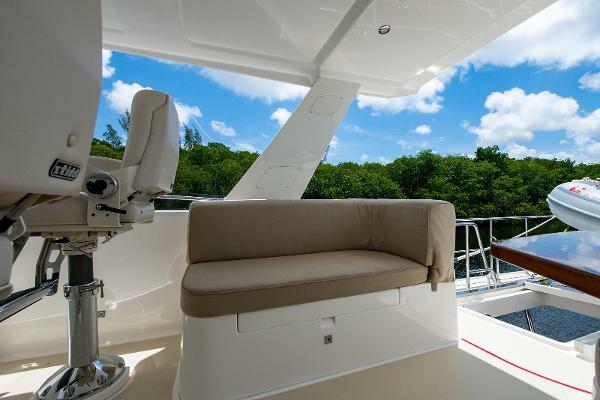 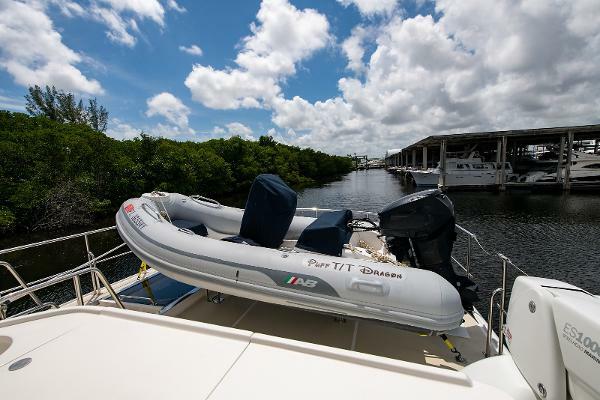 There is a large space just aft of the wet bar area and forward of the dinghy that can be used for other deck furniture or storage for additional toys. 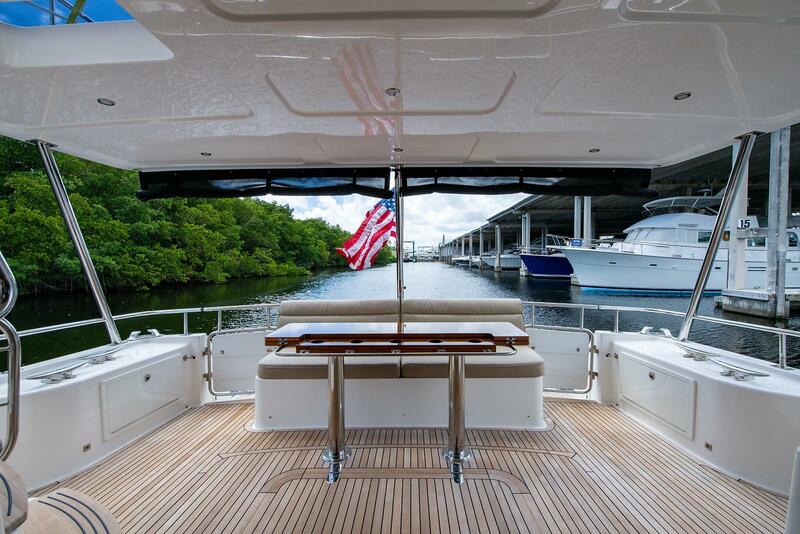 Safety rails surround the entire flybridge. 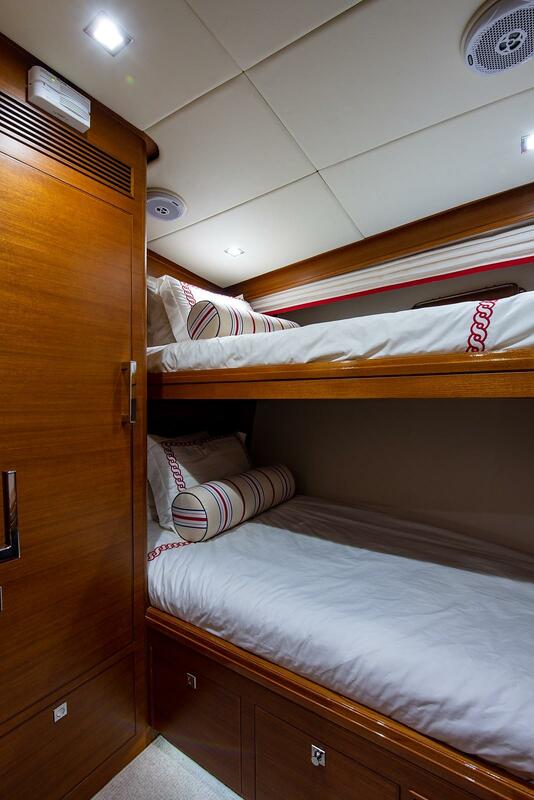 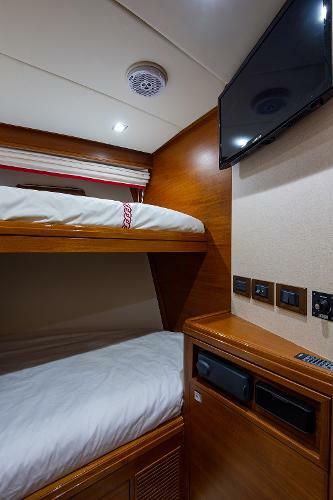 As we go below decks, we have a fantastic layout with three staterooms and 2 heads with separate stall showers. There is a utility room aft of the master with full-size Asko washer and dryer, additional freezer, workbench with custom maple top and several tall and wide storage lockers and drawers. 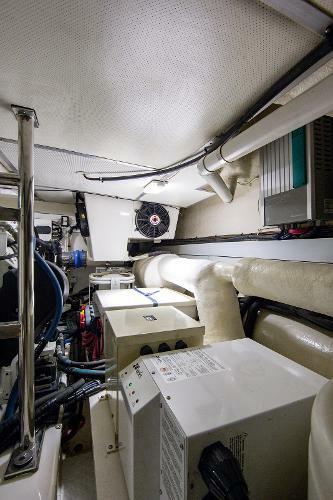 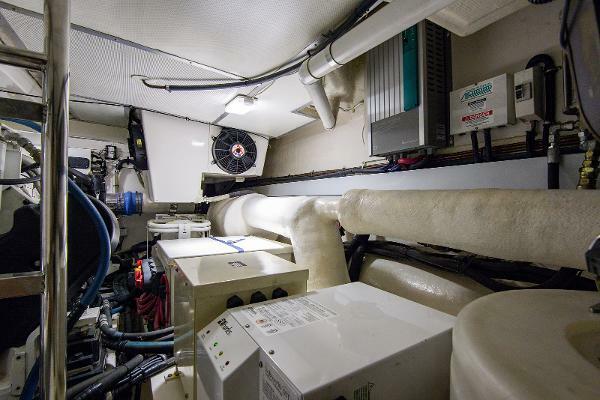 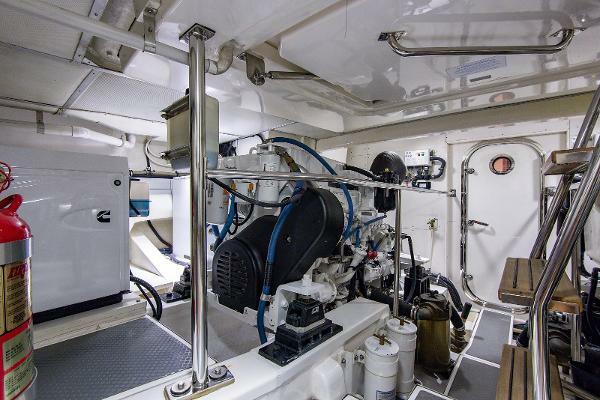 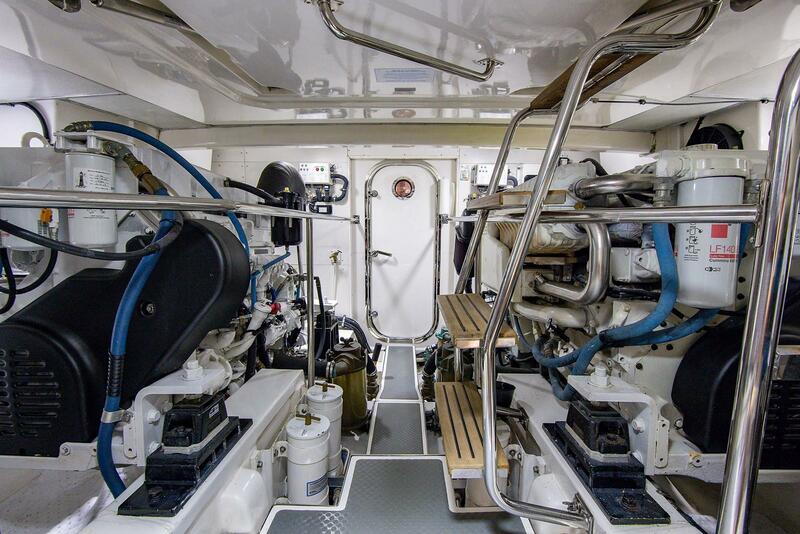 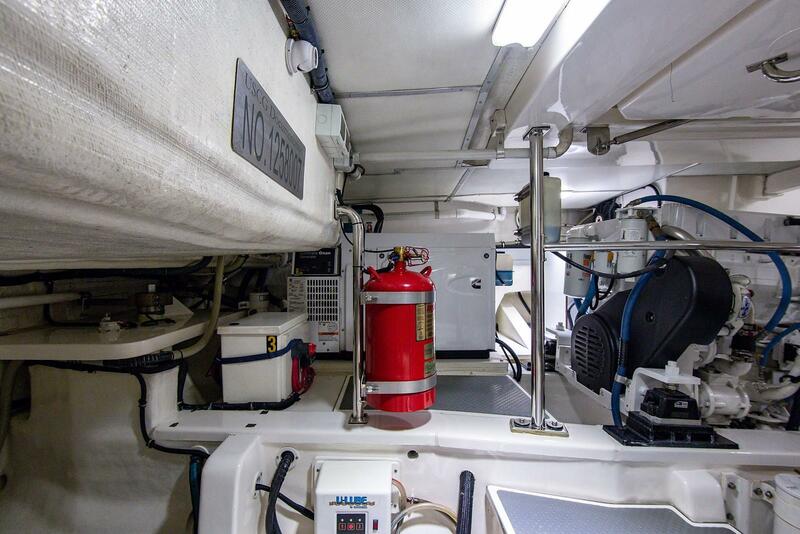 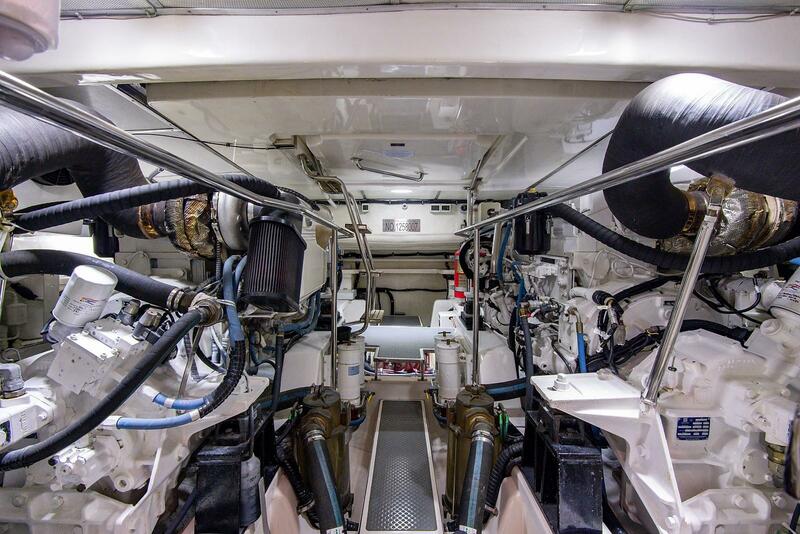 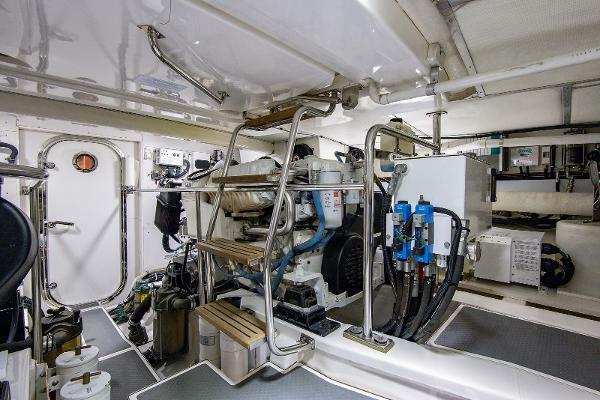 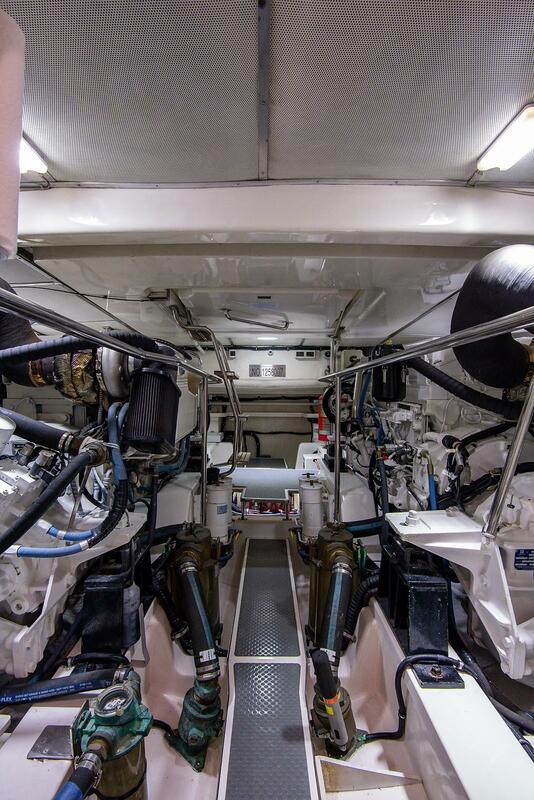 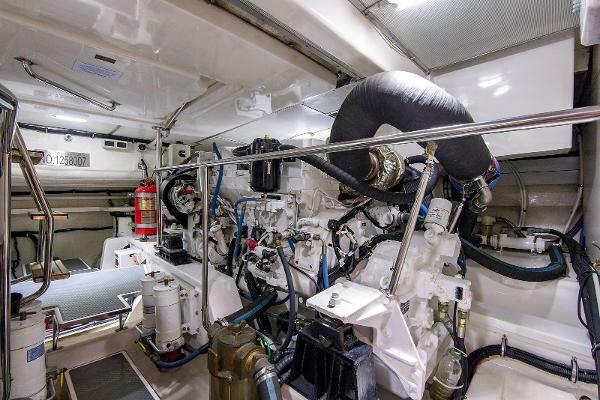 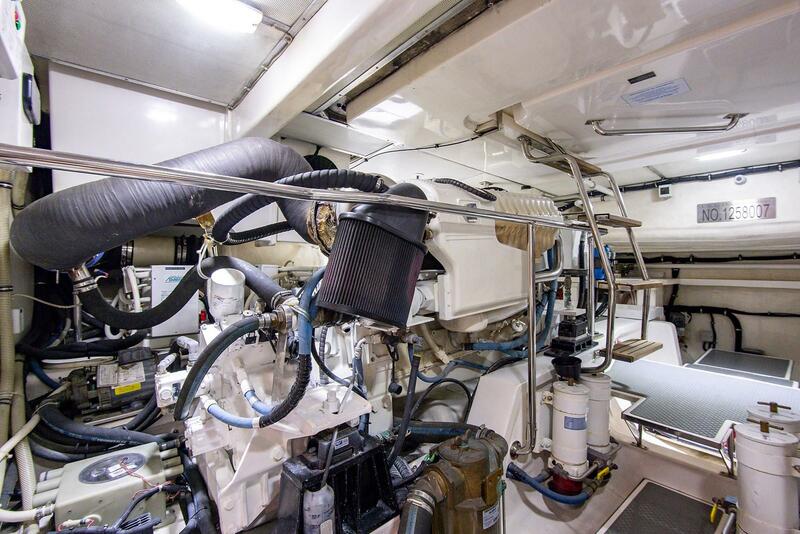 The engine room can be accessed either through the aft deck or through the aft utility room and is very spacious with full standing headroom and the best access to the engines and other systems on a boat of this size than you’ve ever seen before. 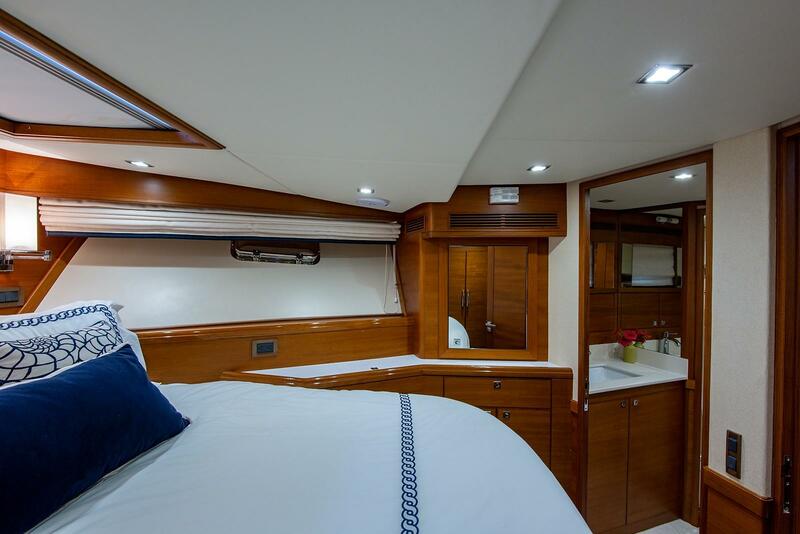 The master stateroom is amidships and features a large walkaround berth, which is 65” wide and very low with storage below. 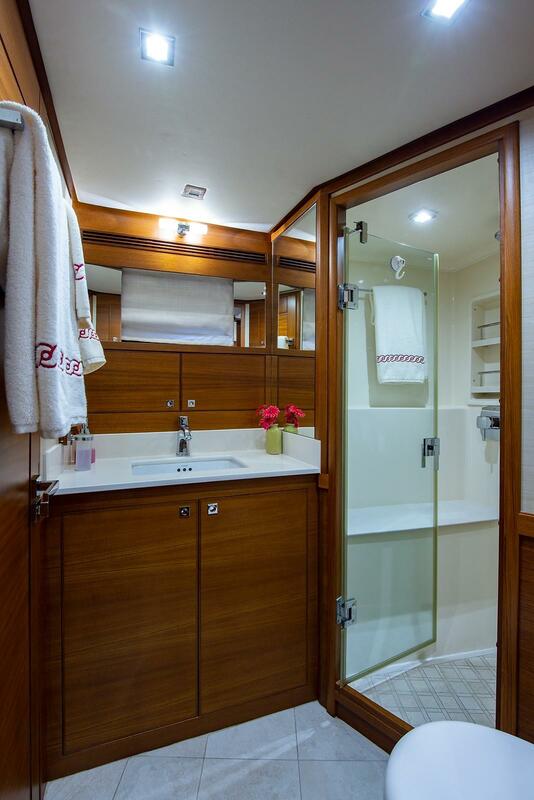 There is a large cedar-lined hanging locker on the aft section and a multitude of storage drawers and cabinets throughout this stateroom. 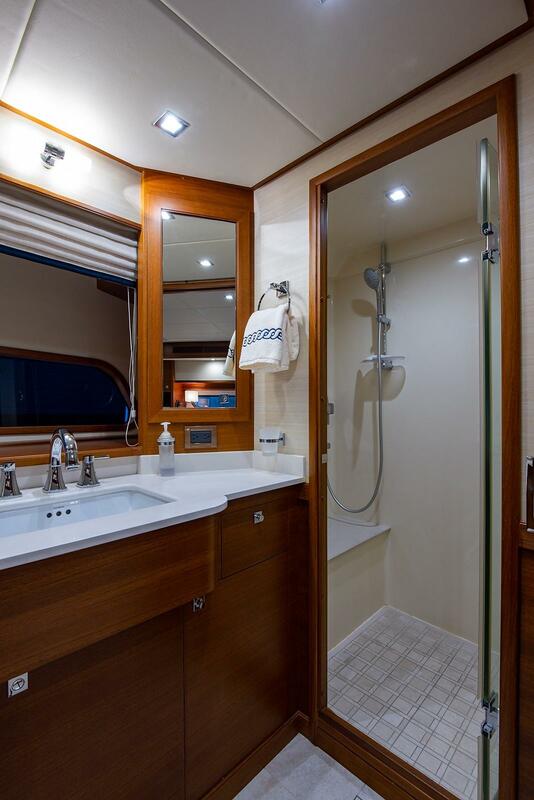 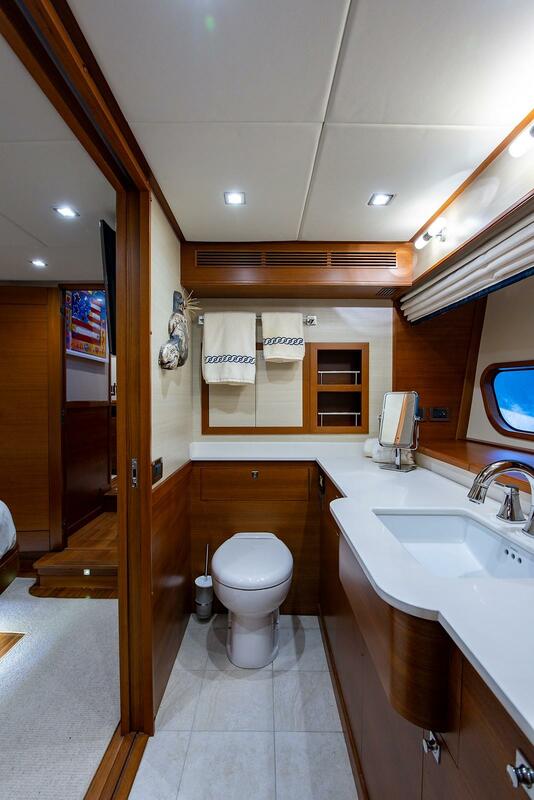 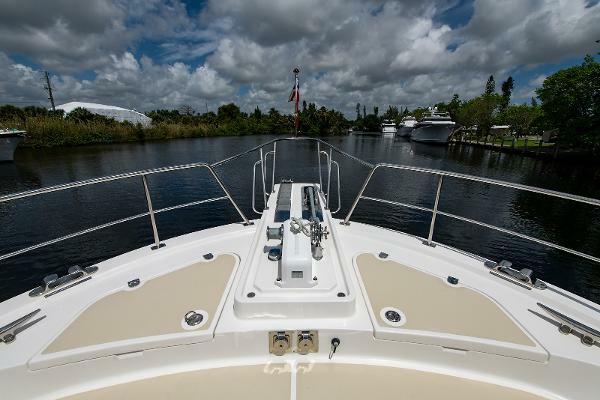 The en suite head on the port side allows you to truly feel the full beam of the boat. 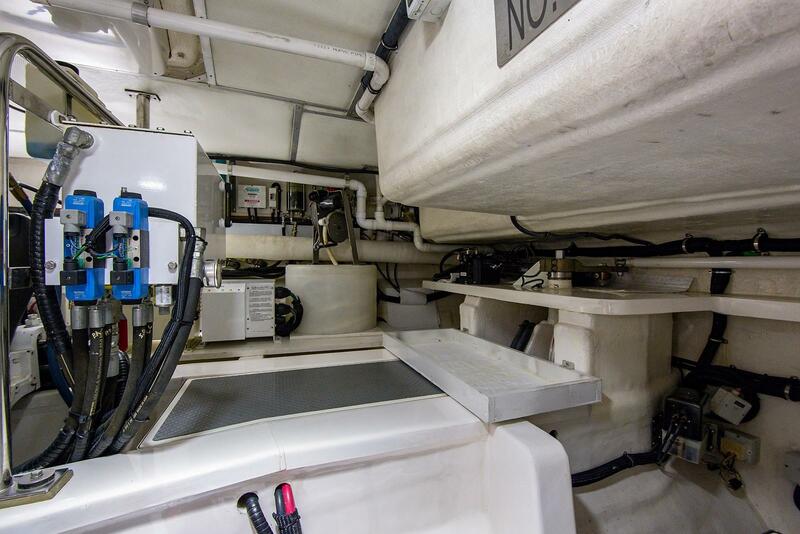 And on both sides of the hull, you have two large fixed ports for natural light. 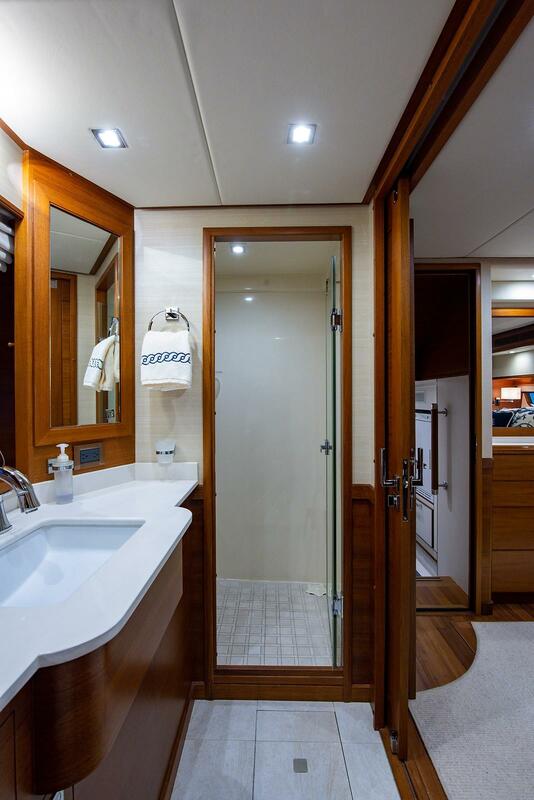 The private en suite master head features a large Corian sink, lift-up storage lockers with mirrors below, large medicine cabinet, storage below the sink and large shower with seat and tiled floor. 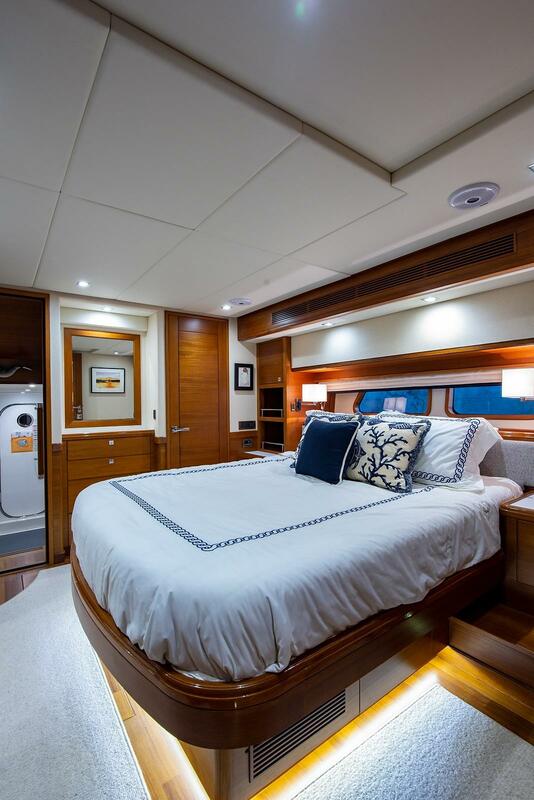 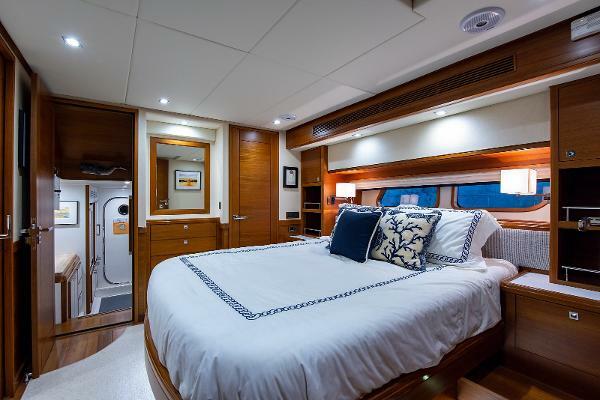 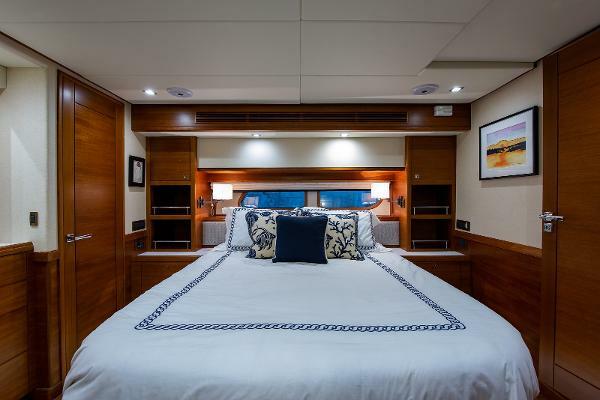 The forward VIP guest stateroom features an island berth which is easy to access from port or starboard sides, cedar-lined hanging locker to port, cabinet with mirror above and storage below to starboard, storage drawers below the berth, hatch overhead and two large opening ports. 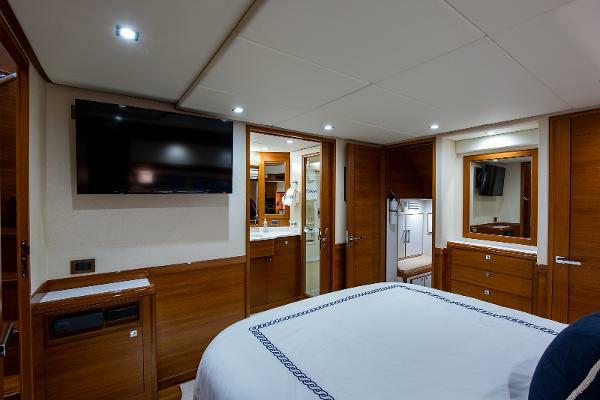 The guest stateroom just aft and to port features two single upper & lower berths, drawer storage below, a cedar-lined hanging locker aft and an opening port. 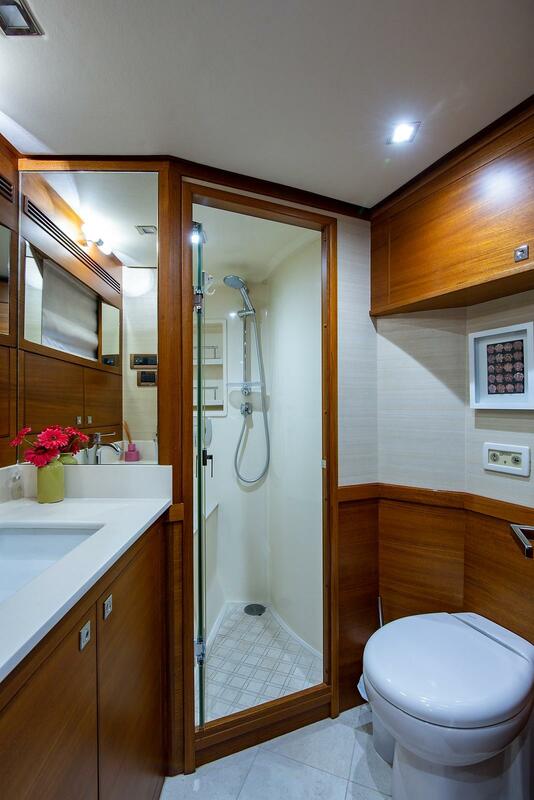 The guest head is directly across and features a stall shower, Corian sink with storage below and an opening port. 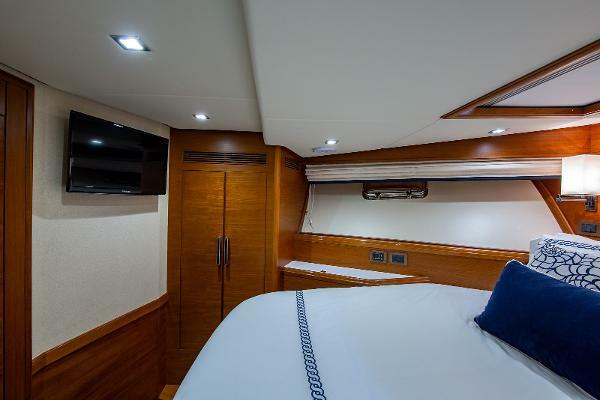 The guest head can be accessed from the companionway or from the forward VIP guest stateroom. 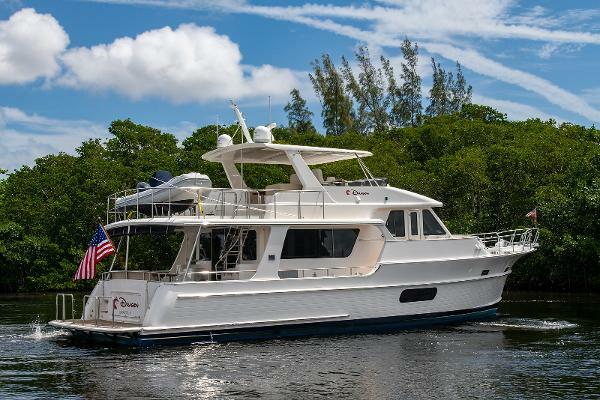 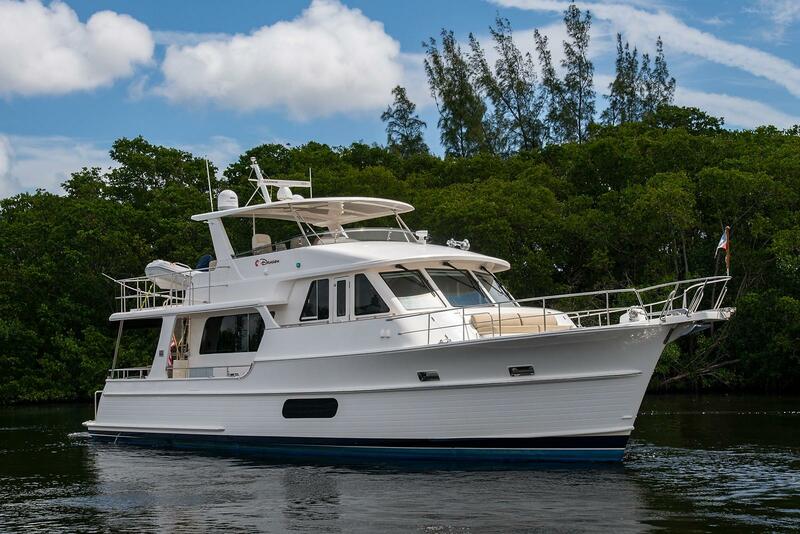 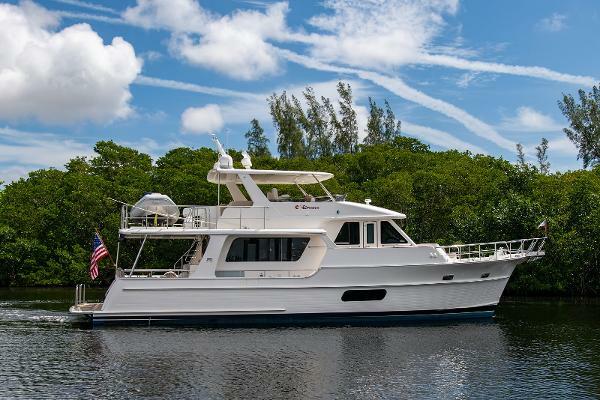 Contact Steve Fithian, Your factory direct Grand Banks Specialist, today for all the details on this beautiful Grand Banks 55 Aleutian RP or any other Grand Banks model.